The principal constituents of milk are water, fat, proteins, lactose (milk sugar) and minerals (salts). Milk also contains trace amounts of other substances such as pigments, enzymes, vitamins, phospholipids (substances with fatlike properties), and gases. The residue left when water and gases are removed is called the dry matter (DM) or total solids content of the milk. Milk is a very complex product. In order to describe the various constituents of milk and how they are affected by the various stages of treatment in the dairy, it is necessary to resort to chemical terminology. This chapter on the chemistry of milk therefore begins with a brief review of some basic chemical concepts. The atom is the smallest building block of all matter in nature and cannot be divided chemically. A substance in which all the atoms are of the same kind is called an element. More than 100 elements are known today. Examples are oxygen, carbon, copper, hydrogen and iron. However, most naturally-occurring substances are composed of several different elements. Air, for example, is a mixture of oxygen, nitrogen, carbon dioxide and rare gases, while water is a chemical compound of the elements hydrogen and oxygen. 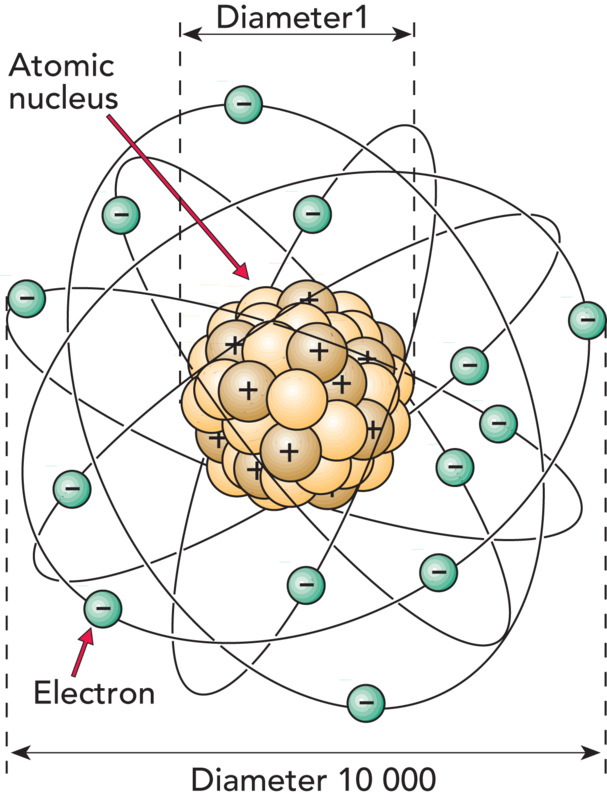 The nucleus of the atom consists of protons and neutrons, Figure 2.1. The protons carry a positive unit charge, while the neutrons are electrically neutral. The electrons, which orbit the nucleus, carry a negative charge equal and opposite to the unit charge of the protons. 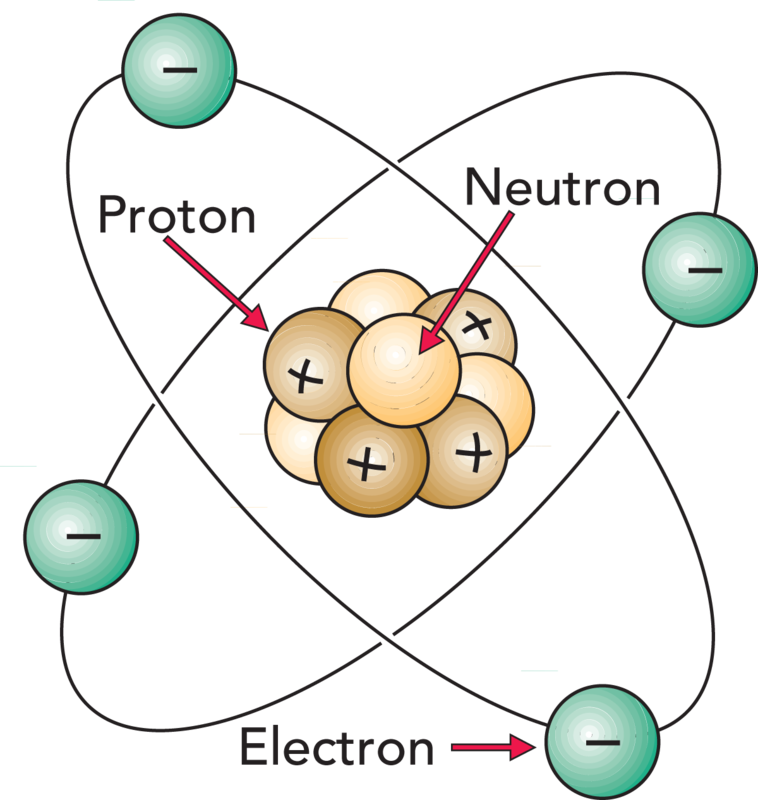 An atom contains equal numbers of protons and electrons with an equal number of positive and negative charges. The atom is therefore electrically neutral. An atom is very small, Figure 2.2. There are about as many atoms in a small copper coin as there are seconds in a thousand million million years! Even so, an atom consists mostly of empty space. If we call the diameter of the nucleus one, the diameter of the whole atom is about 10 000. The nucleus of the atom consists of protons and neutrons. Electrons orbit the nucleus. The nucleus is so small in relation to the atom that if it were enlarged to the size of a tennis ball, the outer electron shell would be 325 metres from the centre. An atom may lose or gain one or more electrons. Such an atom is no longer electrically neutral. It is called an ion. If the ion contains more electrons than protons it is negatively charged, but if it has lost one or more electrons it is positively charged. Positive and negative ions are always present at the same time; i.e. in solutions as cations (positive charge) and anions (negative charge) or in solid form as salts. Common salt consists of sodium (Na) and chlorine (Cl) ions and has the formula NaCl (sodium chloride). Atoms of the same element or of different elements can combine into larger units, which are called molecules. The molecules can then form solid substances, e.g. iron (Fe) or siliceous sand (SiO2), liquids, e.g. water (H2O), or gases, e.g. hydrogen (H2). If the molecule consists mainly of carbon (C), hydrogen (H2) and oxygen (O2) atoms, the compound formed is said to be organic, i.e. produced from organic elements. An example is lactic acid (C3H603). The formula means that the molecule is made up of three carbon atoms, six hydrogen atoms and three oxygen atoms. The number of atoms in a molecule can vary enormously. There are molecules which consist of two linked atoms, and others composed of hundreds of atoms. Cows’ milk consists of about 87 % water and 13 % dry substance, table 2.1. The dry substance is suspended or dissolved in the water. Depending on the type of solids and size of particle (table 2.2), there are different distribution systems of them in the water phase. Physical-chemical status of cows’ milk. Organic compounds contain mainly carbon, oxygen and hydrogen. Inorganic compounds contain mainly other atoms. Relative sizes of particles in milk. 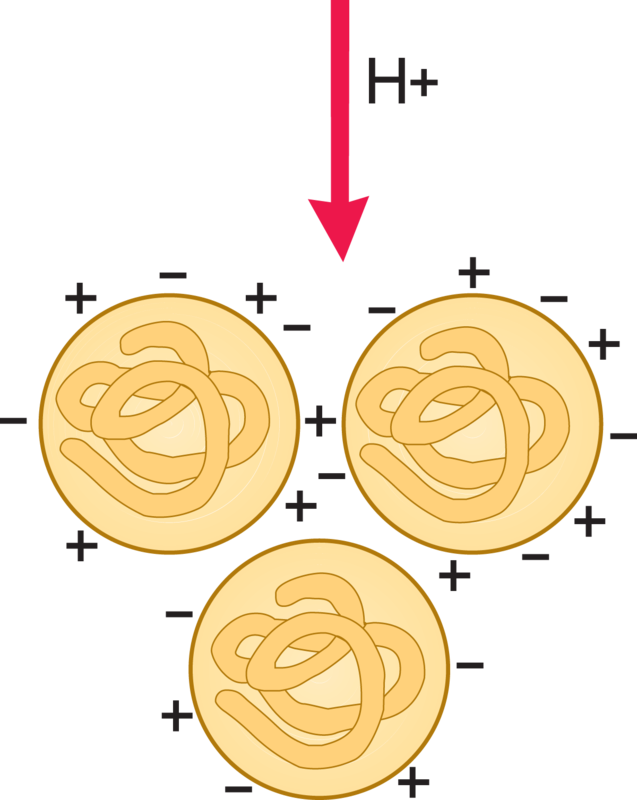 When milk and cream turn to butter, there is a phase inversion from an oil-in-water emulsion to a water-in-oil emulsion. Emulsion: a suspension of droplets of one liquid in another. Milk is an emulsion of oil in water (o/w), butter an emulsion of water in oil (w/o), Figure 2.5. The finely divided liquid is known as the dispersed phase and the other as the continuous phase. Collodial solution: when matter exists in a state of division intermediate to true solution (e.g. sugar in water) and suspension (e.g. chalk in water) it is said to be in colloidal solution or colloidal suspension. In milk the whey proteins are present as a colloidal solution and the comparatively larger caseins as a colloidal suspension (see figure 2.6). Substances such as salts destabilize colloidal systems by changing the water binding and thereby reducing protein solubility. Factors such as heat cause unfolding of the whey proteins and increased interaction between the proteins and alcohol may dehydrate the particles. Non-ionic solutions. When lactose is dissolved in water, no important changes occur in the molecular structure of the lactose. Ionic solutions. 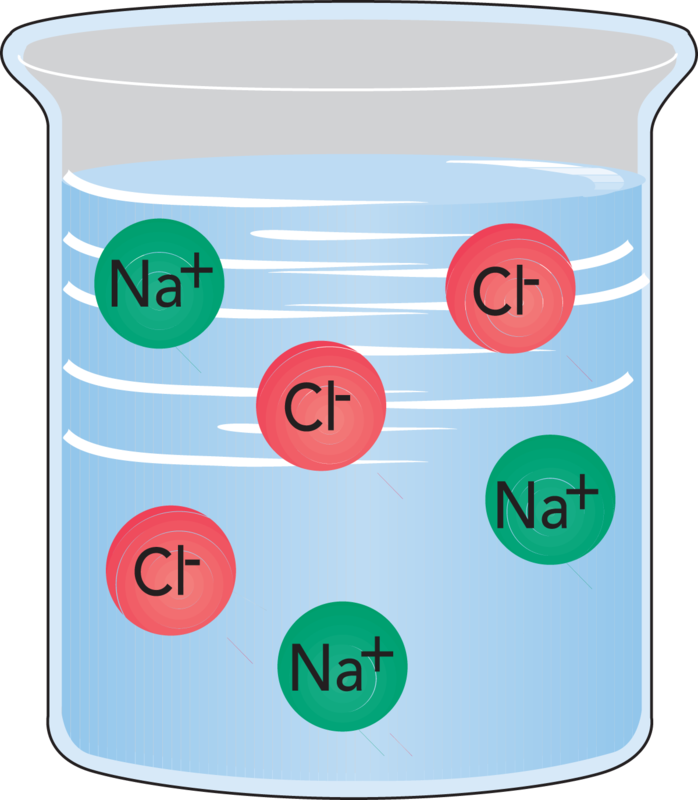 When common salt is dissolved in water, cations (Na+) and anions (Cl–) are dispersed in the water, forming an electrolyte, Figure 2.7. When an acid (e.g. hydrochloric acid, HCl) is mixed with water it releases hydrogen ions (protons) with a positive charge (H+). These quickly attach themselves to water molecules, forming hydrogen (H30+) ions. When a base (a metal oxide or hydroxide) is added to water, it forms a basic or alkaline solution. 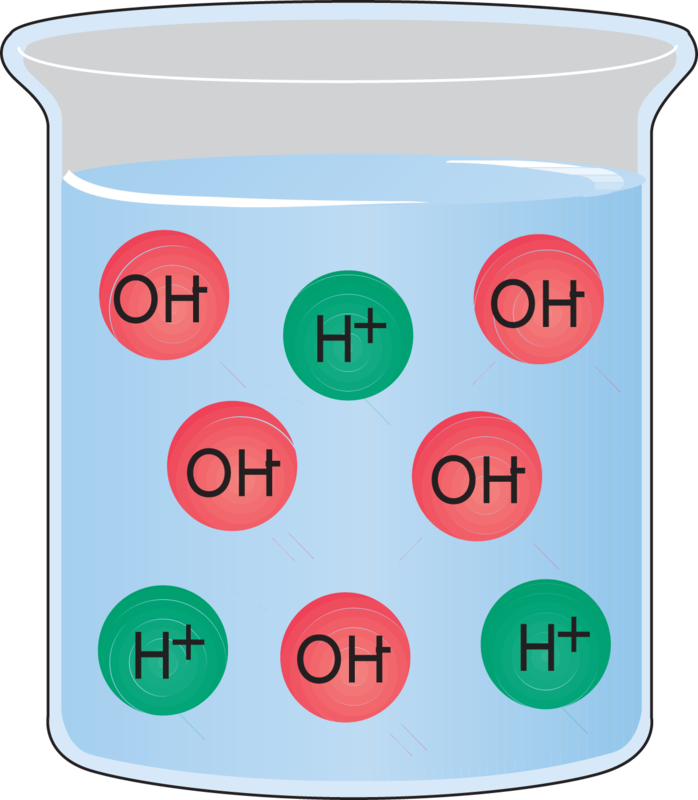 When the base dissolves it releases hydroxide (OH–) ions. 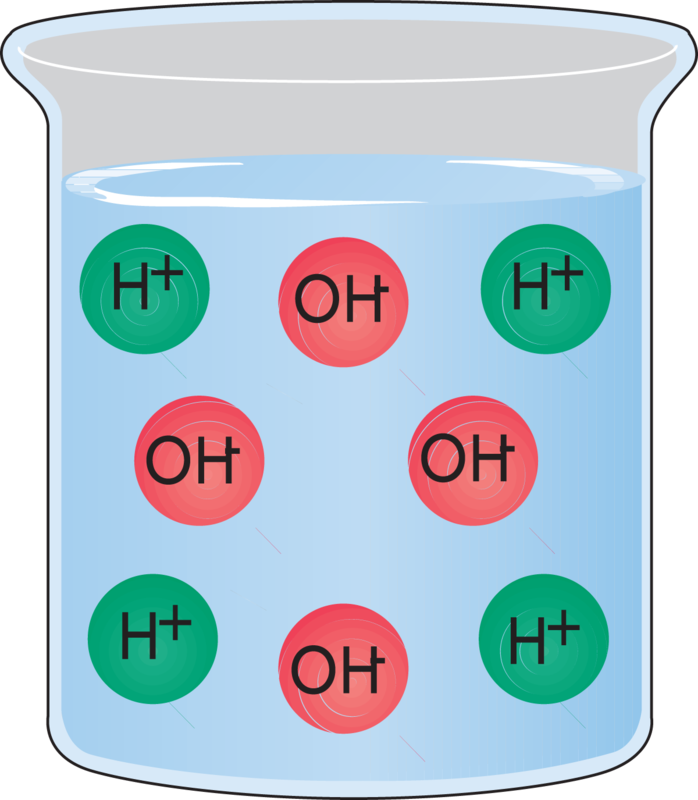 A solution that contains equal numbers of hydroxide and hydrogen ions is neutral. Figure 2.8. A solution that contains more hydroxide ions than hydrogen ions is alkaline. Figure 2.9. A solution that contains more hydrogen ions than hydroxide ions is acid. Figure 2.10. The acidity of a solution is determined as the concentration of hydrogen ions. However, this varies a great deal from one solution to another. The symbol pH is used to denote the hydrogen ion concentration. Neutralization results in the formation of a salt. When hydrochloric acid (HCl) is mixed with sodium hydroxide (NaOH), the two react to form sodium chloride (NaCl) and water (H20). The salts of hydrochloric acid are called chlorides, and other salts are similarly named after the acids from which they are formed: citric acid forms citrates, nitric acid forms nitrates, and so on. The particles present in a solution – ions, molecules or colloids – are influenced by forces which cause them to migrate (diffuse) from areas of high concentration to areas of low concentration. The diffusion process continues until the whole solution is homogeneous, with the same concentration throughout. Sugar dissolving in a cup of coffee is an example of diffusion. The sugar dissolves quickly in the hot drink, and the sugar molecules diffuse until they are uniformly distributed in the drink. The rate of diffusion depends on particle velocity, which in turn depends on the temperature, the size of the particles, and the difference in concentration between various parts of the solution. 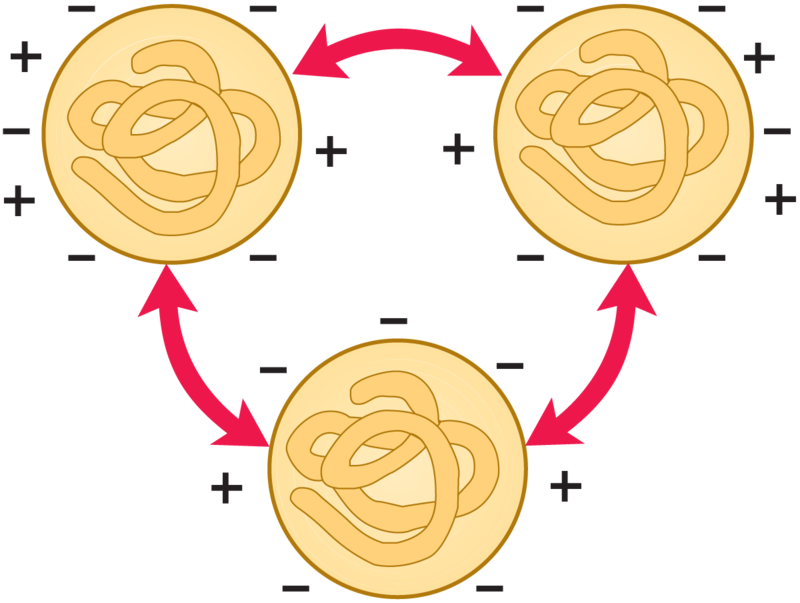 Figure 2.11 illustrates the principle of the diffusion process. The U-tube is divided into two compartments by a permeable membrane. The left leg is then filled with water and the right with a sugar solution whose molecules can pass through the membrane. 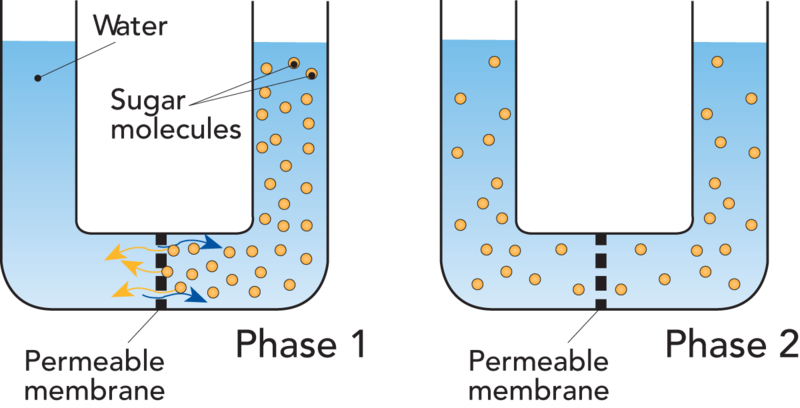 After a while, through diffusion, the concentration is equalized on both sides of the membrane. The sugar molecules diffuse through the permeable membrane and the water molecules diffuse in the opposite direction in order to equalize the concentration of the solution. Osmosis is the term used to describe the spontaneous flow of pure water into an aqueous solution, or from a less to a more concentrated solution, when separated by a suitable membrane. 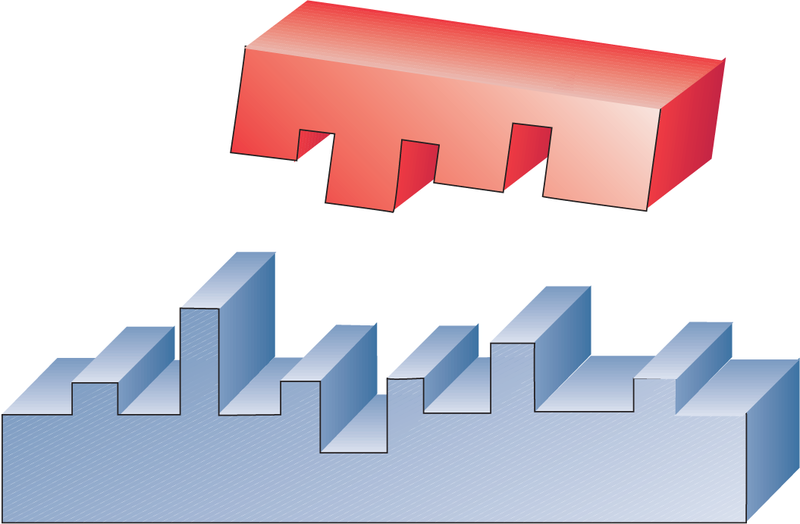 The phenomenon of osmosis can be illustrated by the example shown in Figure 2.12. 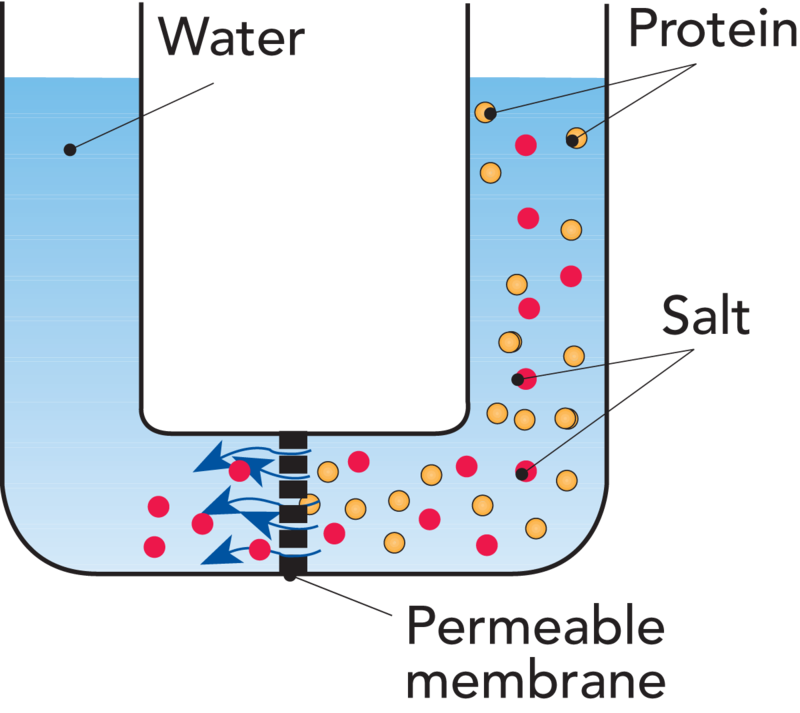 The U-tubes are divided in two compartments by a semi-permeable membrane. The left leg is filled with water and the right with a sugar solution whose molecules cannot pass through the membrane. Now the water molecules will diffuse through the membrane into the sugar solution and dilute it to a lower concentration. This process is called osmosis. The volume of the sugar solution increases when it is diluted. The surface of the solution rises as shown in Figure 2.12, and the hydrostatic pressure, a, of the solution on the membrane becomes higher than the pressure of the water on the other side. 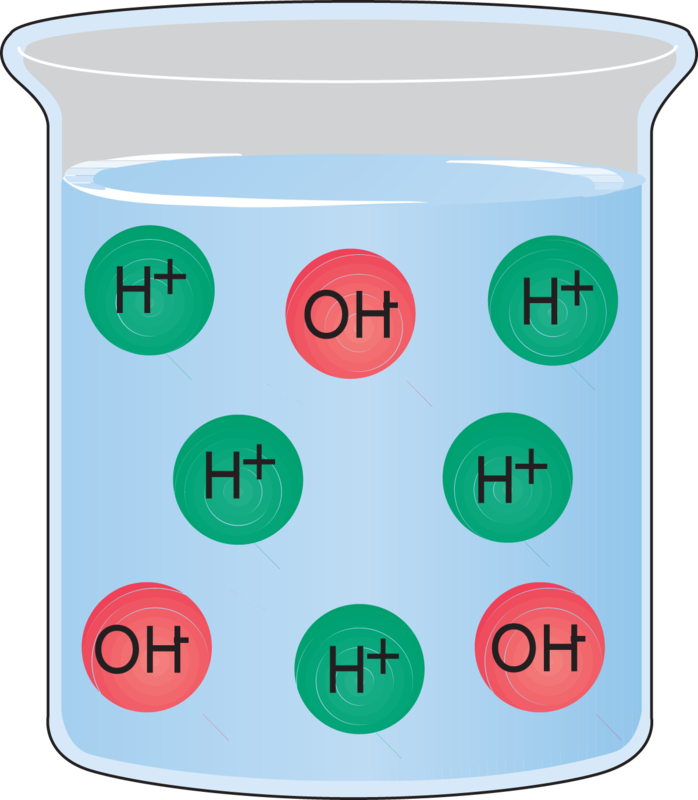 In this state of imbalance, water molecules begin to diffuse back in the opposite direction under the influence of the higher hydrostatic pressure in the solution. The sugar molecules are too large to diffuse through the semi-permeable membrane. Only the small water molecules can diffuse to equalize the concentration. “a” is the osmotic pressure of the solution. If a pressure higher than the osmotic pressure is applied to the sugar solution, water molecules can be made to diffuse from the solution to the water, thereby increasing the concentration of the solution. 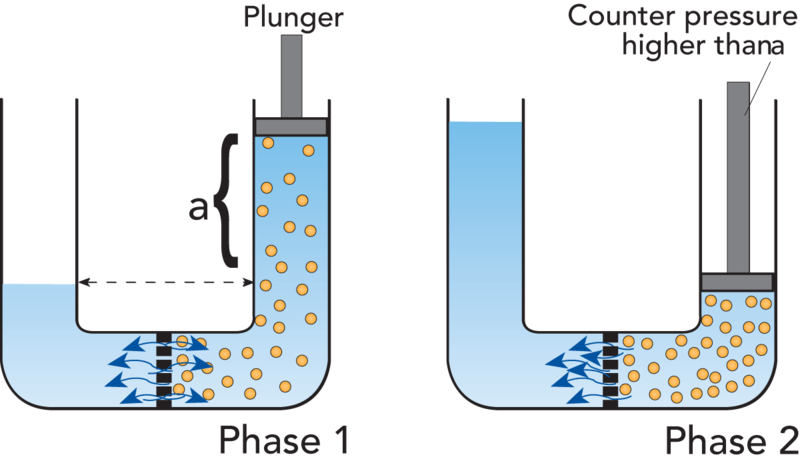 This process illustrated in Figure 2.13 is used commercially to concentrate solutions and is termed Reverse Osmosis (RO). Dialysis is a technique employing the difference in concentration as a driving force to separate large particles from small ones in a solution, for example proteins from salts. The solution to be treated is placed on one side of a membrane, and a solvent (water) on the other side. 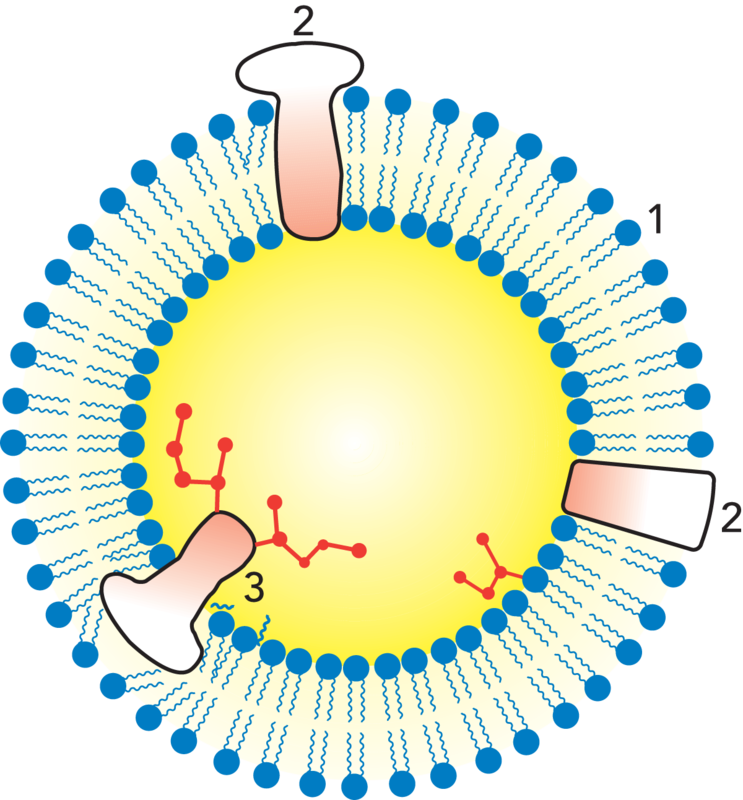 The membrane has pores of a diameter which allows the small salt molecules to pass through, but is too small for the protein molecules to pass, see Figure 2.14. The rate of diffusion varies with the difference in concentration, so dialysis can be speeded up if the solvent on the other side of the membrane is changed often. The quantities of the various main constituents of milk can vary considerably between cows of different breeds and between individual cows of the same breed. Therefore only limit values can be stated for the variations. The numbers in Table 2.3 are simply examples. 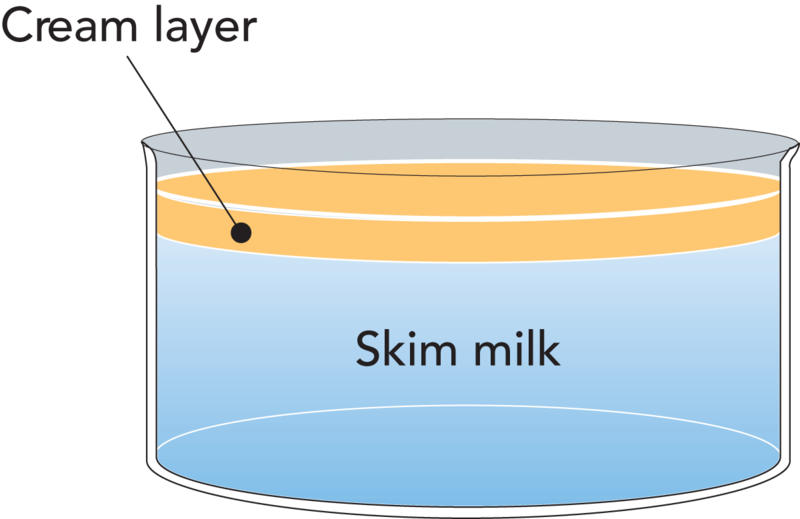 Milk and cream are examples of fat-in-water (or oil-in-water) emulsions. 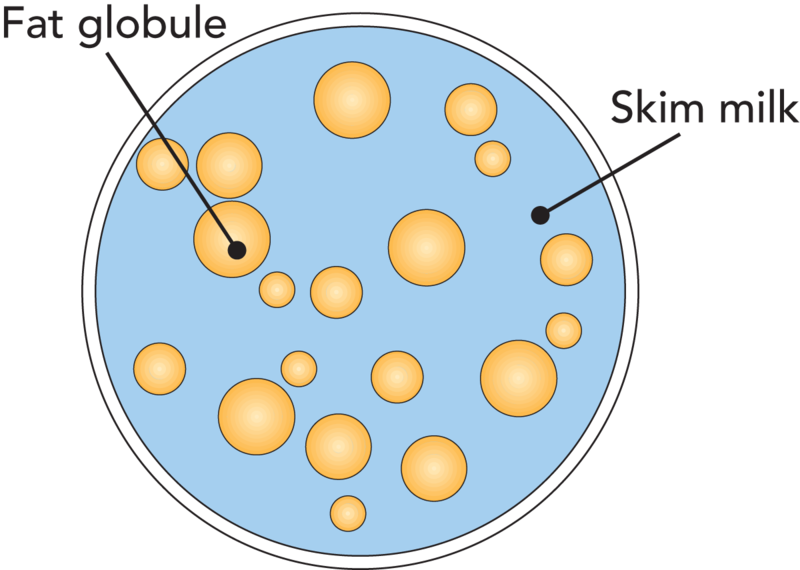 The milk fat exists as small globules or droplets dispersed in the milk serum, Figure 2.15. Their diameters range from 0.1 to 20 µm (1 µm = 0.001 mm). The average size is 3 – 4 µm and there are some 1010 globules per ml. The emulsion is stabilized by a very thin membrane only 10-20 nm thick (1 nm = 10–9 m) which surrounds the globules and has a complicated composition. Milk fat consists of triglycerides (the dominating components), di- and monoglycerides, fatty acids, sterols, carotenoids (giving the yellow colour of the fat) and vitamins (A, D, E, and K). Trace elements are minor components. The composition of a milk fat globule is outlined in Figure 2.16. The membrane consists of phospholipids, lipoproteins, cerebrosides, proteins, nucleic acids, enzymes, trace elements (metals) and bound water. It should be noted that the composition and thickness of the membrane are not constant, because components are constantly being exchanged with the surrounding milk serum. As the fat globules are not only the largest particles in the milk but also the lightest (density at 15.5 °C = 0.93 g/cm3), they tend to rise to the surface when milk is left to stand in a vessel for a while, Figure 2.17. The rate of rise follows Stokes’ Law, but the small size of the fat globules makes creaming a slow process. Cream separation can, however, be accelerated by aggregation of fat globules under the influence of a protein called agglutinin. These aggregates rise much faster than individual fat globules. The aggregates are easily broken up by heating or mechanical treatment. Agglutinin is denatured at time-temperature combinations such as 75 °C/ 2 min and the possibility of aggregation disappears. The composition of milk fat. Size 0.1 – 20 μm. Average size 3 – 4 μm. Milk fat is liquid when milk leaves the udder at 37 °C. This means that the fat globules can easily change their shape when exposed to moderate mechanical treatment – pumping and flowing in pipes for instance – without being released from their membranes. All fats belong to a group of chemical substances called esters, which are compounds of alcohols and acids. Milk fat is a mixture of different fatty-acid esters called triglycerides, which are composed of an alcohol called glycerol and various fatty acids. Glycerides make up almost 99 % of milk fat. A fatty-acid molecule is composed of a hydrocarbon chain and a carboxyl group (formula RCOOH). 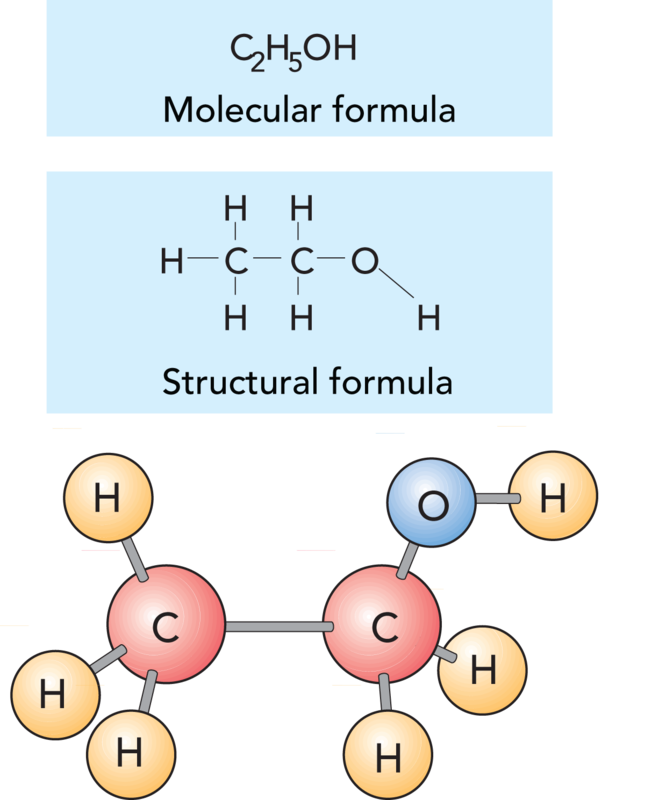 In saturated fatty acids, the carbon atoms are linked together in a chain by single bonds, while in unsaturated fatty acids there are one or more double bonds in the hydrocarbon chain, see Figure 2.19. Each glycerol molecule can bind three fatty-acid molecules, and as the three need not necessarily be of the same kind, the number of different glycerides in milk is extremely large, see Figure 2.20. Table 2.4 lists the most important fatty acids in milk fat triglycerides. Milk fat is a mixture of different fatty acids and glycerol. Table 2.4 shows that the four most abundant fatty acids in milk are myristic, palmitic, stearic and oleic acids. The first three are solid and the last is liquid at room temperature. As the quoted figures indicate, the relative amounts of the different fatty acids can vary considerably. This variation affects the hardness of the fat. Fat with a high content of high-melting fatty acids, such as palmitic acid, will be hard; on the other hand, fat with a high content of low-melting oleic acid makes soft butter. Determining the quantities of individual fatty acids is a matter of purely scientific interest. For practical purposes, it is sufficient to determine one or more constants or indices which provide certain information concerning the composition of the fat. Fatty acids with the same numbers of C and H atoms but with different numbers of single and double bonds have completely different characteristics. The most important and most widely used method of indicating their specific characteristics is to measure the iodine value (IV) of the fat. The iodine value states the percentage of iodine that the fat can bind. Iodine is taken up by the double bonds of the unsaturated fatty acids. Since oleic acid is by far the most abundant of the unsaturated fatty acids, which are liquid at room temperature, the iodine value is largely a measure of the oleic-acid content and thereby of the softness of the fat. The iodine value of butterfat normally varies between 24 and 46. The variations are determined by what the cows eat. Green pasture in the summer promotes a high content of oleic acid, so that summer milk fat is soft (high iodine value). Certain fodder concentrates, such as sunflower cake and linseed cake, also produce soft fat, while coconut and palm oil cake and root vegetable tops produce hard fat. It is therefore possible to influence the consistency of milk fat by choosing a suitable diet for the cows. Figure 2.21 shows an example of how the iodine value of milk fat can vary in the course of a year (Sweden). Fat with a high content of high-melting fatty acids is hard. Fat with a high content of low-melting fatty acids is soft. The amount of different fatty acids in fat also affects the way it refracts light. It is therefore common practice to determine the refractive index of fat, which can then be used to calculate the iodine value. This is a quick method of assessing the hardness of the fat. Instead of analysing the iodine value or refractive index, the ratio of saturated fat to unsaturated fat can be determined by pulsed NMR. A conversion factor can be used to transform the NMR value into a corresponding iodine value if desired. The NMR method can also be utilized to find out the degree of fat crystallization as a function of the time of crystallization. It has been shown that fat crystallization takes a long time in a 40 % cream cooled from 60 °C to 5 °C. A crystallization time of at least two hours is needed, and the proportion of crystallized fat is 65% of the total, see figure 2.22. During the crystallization process, the fat globules are in a very sensitive state and are easily damaged and opened up – even by moderate mechanical treatment. 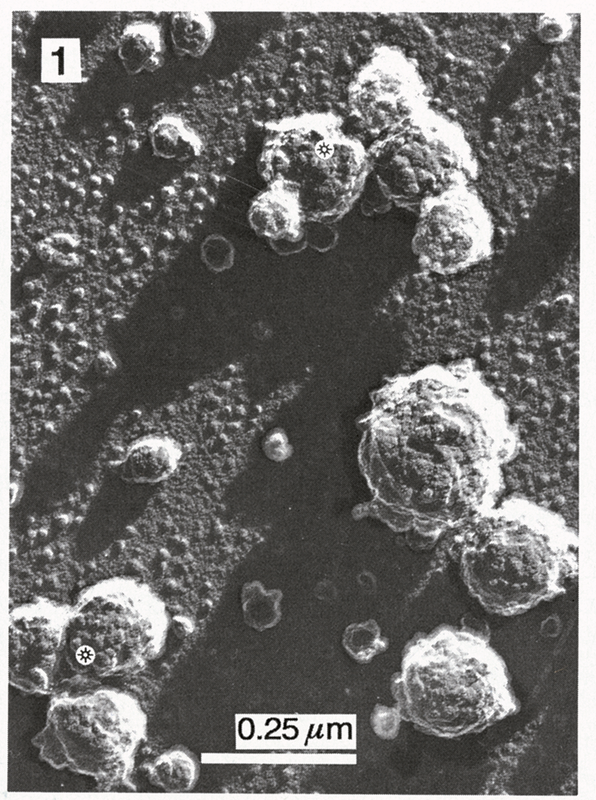 Electron microscope studies have shown that fat crystallizes in monomolecular spheres, see Figure 2.22. 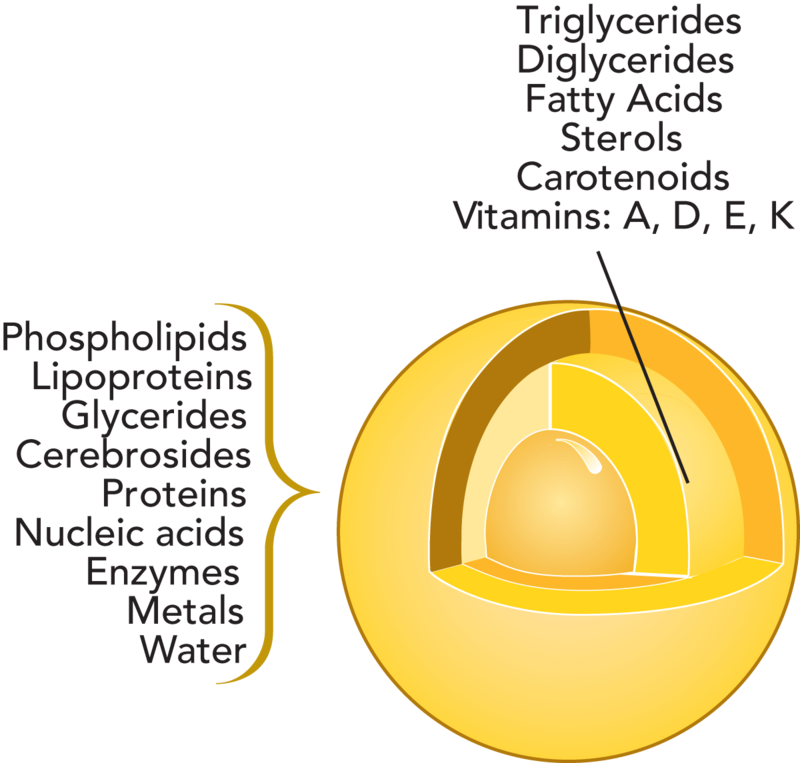 At the same time fractionation takes place, so that the triglycerides with the highest melting points form the outer spheres. Because crystallized fat has a lower specific volume than liquid fat, tensions arise inside the globules, making them particularly unstable and susceptible to breakage during the crystallization period. The result is that liquid fat is released into the milk serum, causing formation of lumps where the free fat glues the unbroken globules together (the same phenomenon that occurs in butter production). 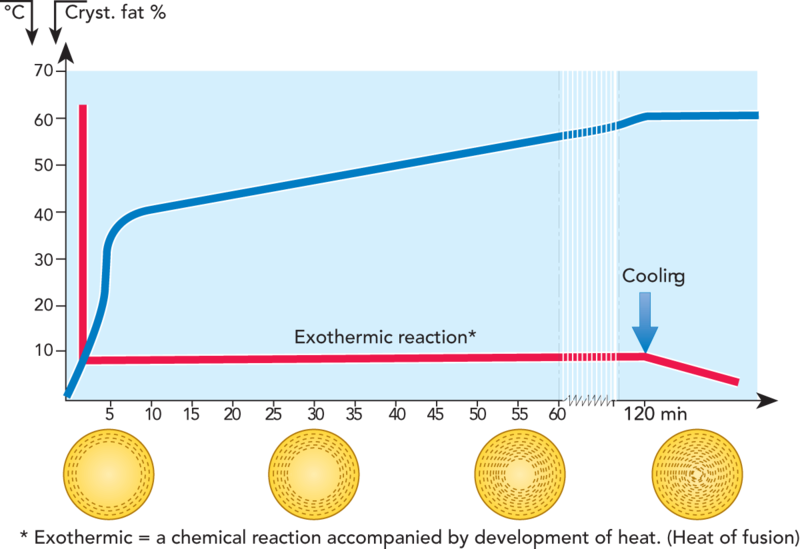 Crystallization of fat generates fusion heat, which raises the temperature somewhat (40% cream cooled from 60 °C to 7 – 8 °C grows 3 – 4 °C warmer during the crystallization period). It is important to bear this important property of milk fat in mind in production of cream for various purposes. Milk fat crystallization is an exothermic reaction, which means that the chemical reaction is accompanied by evolution of heat. 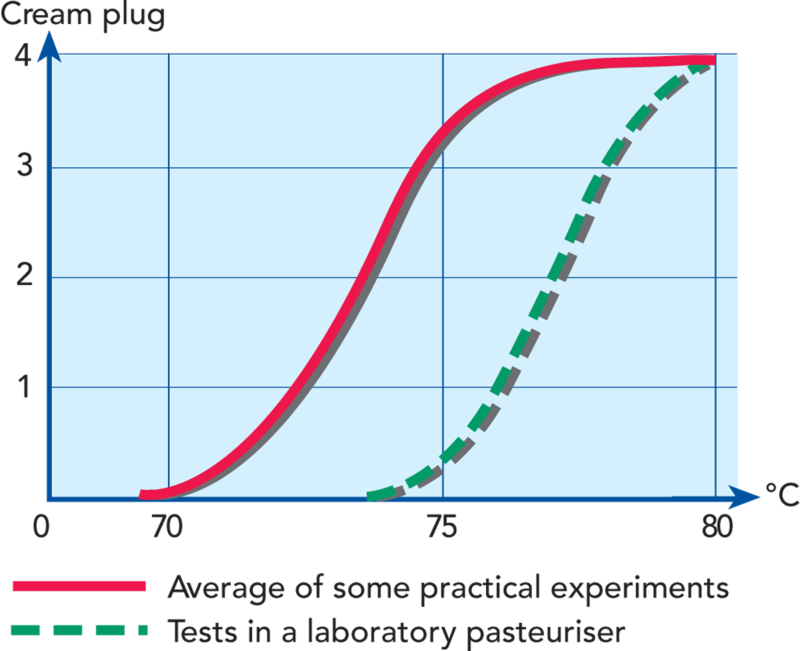 The crystallization curve is based on analysis made by the NMR method. Model of a protein molecule chain of amino acids, the amino and carboxyl groups. Proteins are an essential part of our diet. The proteins we eat are broken down into simpler compounds in the digestive system and in the liver. These compounds are then conveyed to the cells of the body where they are used as construction material for building the body’s own protein. The great majority of the chemical reactions that occur in the organism are controlled by certain active proteins, the enzymes. The amino acids in Figure 2.24 are the building blocks forming the protein, and they are distinguished by the simultaneous presence of one amino group (–NH2) and one carboxyl group (–COOH) in the molecule. The proteins are formed from a specific kind of amino acids, α amino acids, i.e. those which have both an amino group and a carboxyl group bound to the same carbon atom, the α-carbon. The amino acids belong to a group of chemical compounds which can emit hydrogen ions in alkaline solutions and absorb hydrogen ions in acid solutions. Such compounds are called amphotery electrolytes or ampholytes. Proteins are built from 20 amino acids. An important fact with regard to nutrition is that eight (nine for infants) of the 20 amino acids cannot be synthesized by the human organism. As they are necessary for maintaining a proper metabolism, they have to be supplied with the food. They are called essential amino acids, and all of them are present in milk protein. The type and the order of the amino acids in the protein molecule determine the nature of the protein. Any change of amino acids regarding type or place in the molecular chain may result in a protein with different properties. As the possible number of combinations of 20 amino acids in a chain containing 100 – 200 amino acids is very large the number of proteins with different properties is also very large. Figure 2.24 shows a model of an amino acid. As mentioned before, amino acids contain both a slightly basic amino group (–NH2) and a slightly acid carboxyl group (–COOH). These groups are connected to a side chain, (R). If the side chain is polar, the water-attracting properties of the basic and acid groups, in addition to the polar side chain, will normally dominate and the whole amino acid will attract water and dissolve readily in water. 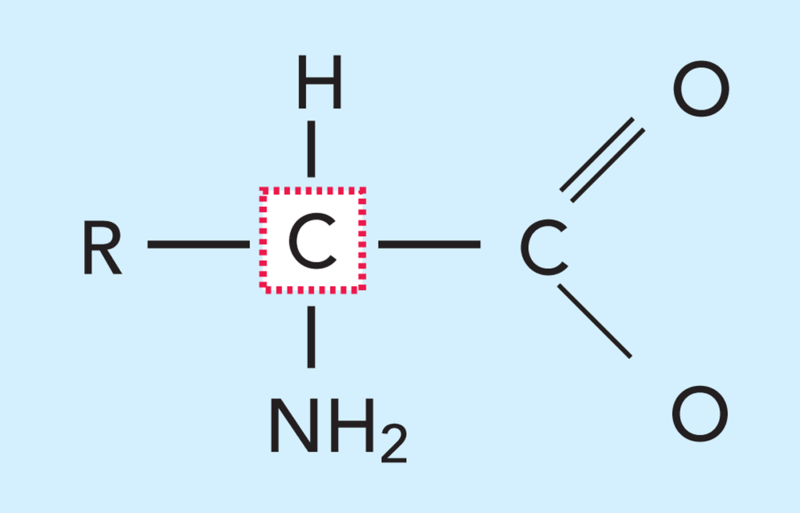 Such an amino acid is named hydrophilic (water-loving). If on the other hand the side chain is of hydrocarbon which does not contain hydrophilic radicals, the properties of the hydrocarbon chain will dominate. A long hydrocarbon chain repels water and makes the amino acid less soluble or compatible with water. Such an amino acid is called hydrophobic (water-repellent). (–NH2) in the hydrocarbon chain, its hydrophobic properties will be modified towards more hydrophilic. If hydrophobic amino acids are predominant in one part of a protein molecule, that part will have hydrophobic properties. An aggregation of hydrophilic amino acids in another part of the molecule will, likewise, give that part hydrophilic properties. A protein molecule may therefore be either hydrophilic, hydrophobic, intermediate or locally hydrophilic and hydrophobic. Some milk proteins demonstrate very great differences within the molecules with regard to water compatibility, and some very important properties of the proteins depend on such differences. Hydroxyl groups in the chains of some amino acids in casein may be esterified with phosphoric acid. Such groups enable casein to bind calcium ions or colloidal calcium hydroxyphosphate, forming strong bridges between or within the molecules. The side chains of some amino acids in milk proteins are charged, which is determined by the pH of the milk. When the pH of milk is changed by addition of an acid or a base, the charge distribution of the proteins is also changed. The electrical status of the milk proteins and the resulting properties are illustrated in Figures 2.25 to 2.28. At the normal pH of milk, (≈ 6.6) a protein molecule has a net negative charge, Figure 2.25. 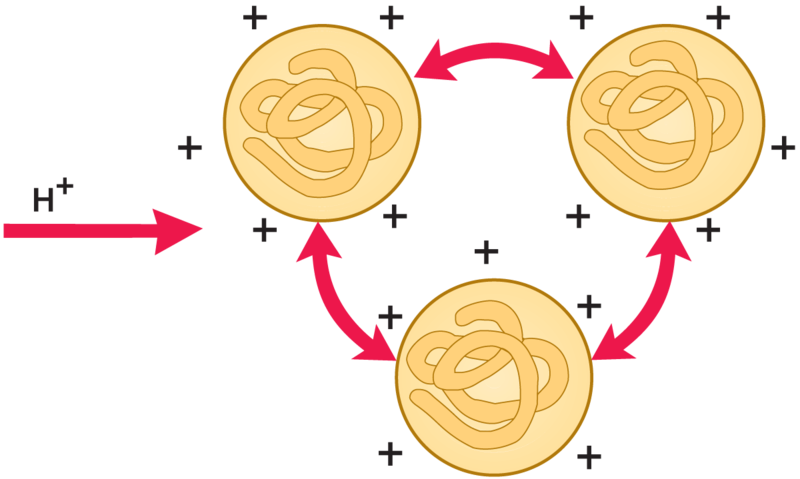 The protein molecules remain separated because identical charges repel each other. If hydrogen ions are added, Figure 2.26, they are adsorbed by the protein molecules. At a pH value where the positive charge of the protein is equal to the negative charge, i.e. where the numbers of NH3+ and COO– groups on the side chains are equal, the net total charge of the protein is zero. The protein molecules no longer repel each other, but the positive charges on one molecule link up with negative charges on the neighbouring molecules and large protein clusters are formed. The protein is then precipitated from the solution. The pH at which this happens is called the isoelectric point of the protein. In the presence of an excess of hydrogen ions, the molecules acquire a net positive charge as shown in Figure 2.27. Then they repel each other once more and therefore remain in solution. If, on the other hand, a strong alkaline solution (NaOH) is added, all proteins acquire negative charges and dissolve. A protein molecule at pH 6.6 has a net negative charge. Protein molecules at pH ≈ 4.6, the isoelectric point. Milk contains hundreds of types of protein, most of them in very small amounts. The proteins can be classified in various ways according to their chemical or physical properties and their biological functions. The old way of grouping milk proteins into casein, albumin and globulin has given way to a more adequate classification system. Table 2.5 shows an abridged list of milk proteins according to a modern system. Minor protein groups have been excluded for the sake of simplicity. Whey protein is a term often used as a synonym for milk-serum proteins, but it should be reserved for the proteins in whey from the cheese making process. In addition to milk-serum proteins, whey protein also contains fragments of casein molecules. Some of the milk-serum proteins are also present in whey in lower concentrations than in the original milk. This is due to heat denaturation during pasteurization of the milk prior to cheese-making. The three main groups of proteins in milk are distinguished by their widely different behaviour and form of existence. The caseins are easily precipitated from milk in a variety of ways, while the serum proteins usually remain in solution. The fat-globule membrane proteins adhere, as the name implies, to the surface of the fat globules and are only released by mechanical action, e.g. by churning cream into butter. 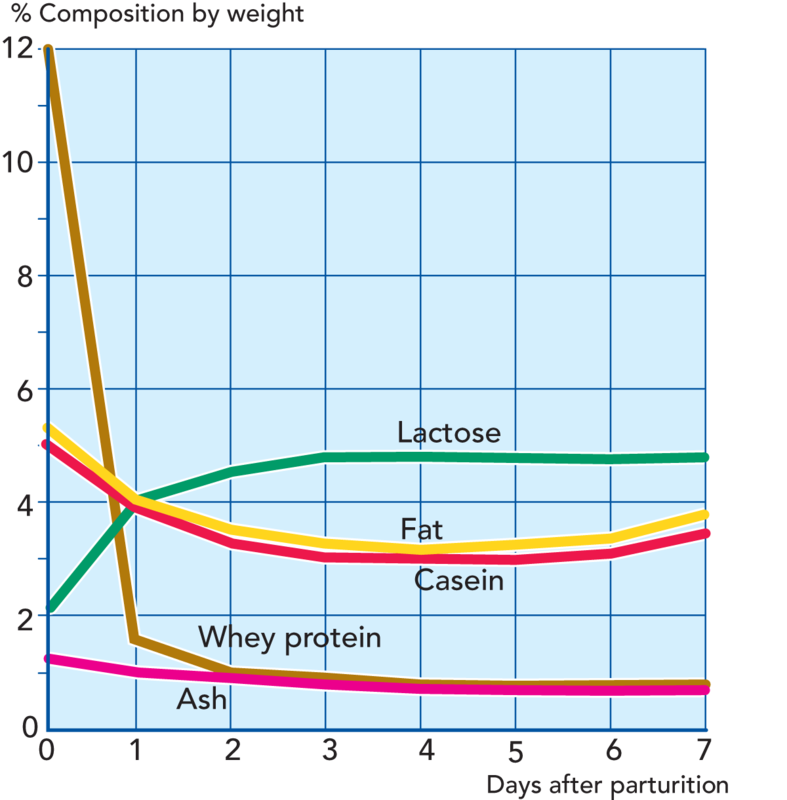 Casein is a mixture of several components (Table 2.5) and is the dominant class of proteins in milk, constituting about four-fifths of the milk proteins. There are four main subgroups of casein, as1-casein, as2-casein, κ-casein and β-casein, which are all heterogeneous and consist of several genetic variants. Genetic variants of a protein differ from each other only by a few amino acids. The caseins self-associate and form large clusters called micelles. The micelles are built up of hundreds and thousands of individual casein protein molecules and vary in size from 50 to 500nm. Since the micelles are of colloidal dimensions they are capable of scattering light and the white colour of skim milk is largely due to light scattering by the casein micelles. The nanocluster model of casein micelles. Sub-micelle model of casein micelle.Ref: A digest of models by Slattery and Evard (1973), Schmidt (1982) and Walstra (1990) according to Rollema (1992). Rollema H.S. (1992) Casein Association and Micelle Formation p 63-111. Elsevier Science Publications Ltd. Percentage of the β - casein not associated with the micelles after keeping milk for about 24 h at varying temperature (Ref. Redrawn from Walstra, Wouters and Geurts 2006, Dairy Science and Technology). Casein micelles have important consequences for the properties of milk. They determine to a large extent the physical stability of milk products during heating and storage, are essential in cheese making and determine rheological properties of fermented and concentrated dairy products. Casein micelles are fairly dense aggregates with small regions of calcium phosphate, which links the micelles together, giving the micelles an open, porous structure. Removal of calcium phosphate (CCP – colloidal calcium phosphate), e.g. by acidification or addition of EDTA or citrates, leads to disintegration of the micelles. Disintegration also occurs when pH becomes greater than 9. The internal structure of a casein micelle has been under debate for a long time and is still not fully understood. There are three main models proposed: the nanocluster model, the dual binding model and the sub-micelle model. There is, however, consensus around several characteristics. 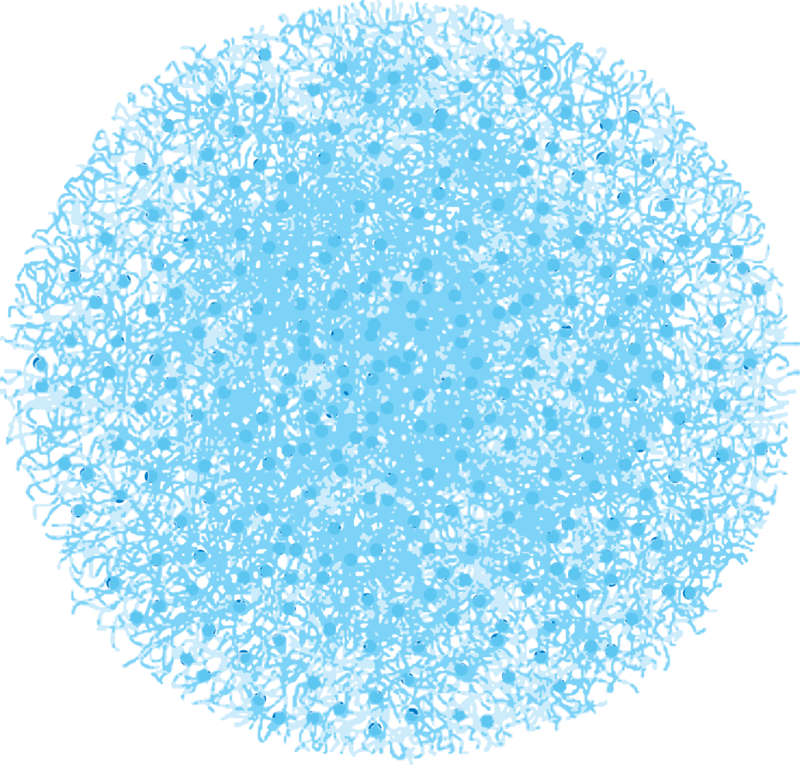 The micelles are roughly spherical particles with an average diameter of about 150 nm but with a large spread in size. The αs- and β-caseins are mainly concentrated in the middle of the micelle, while κ-casein predominates on the surface. There is a “hairy layer” around the micelle, consisting mainly of the C-terminal end of κ - casein that protrudes 5-10 nm from the micelle surface. The protruding κ - casein chain is hydrophilic and negatively charged and gives a major contribution to the steric stability of the micelles. If the hairy layer is removed e.g. by ethanol addition or rennet-induced hydrolysis, the colloidal stability of the micelle is changed and the micelles aggregate or precipitate. Further, it is generally accepted that there are “nanoclusters” of calcium phosphate, which are roughly 3nm in diameter and contains most of the phosphate and calcium in the micelle. 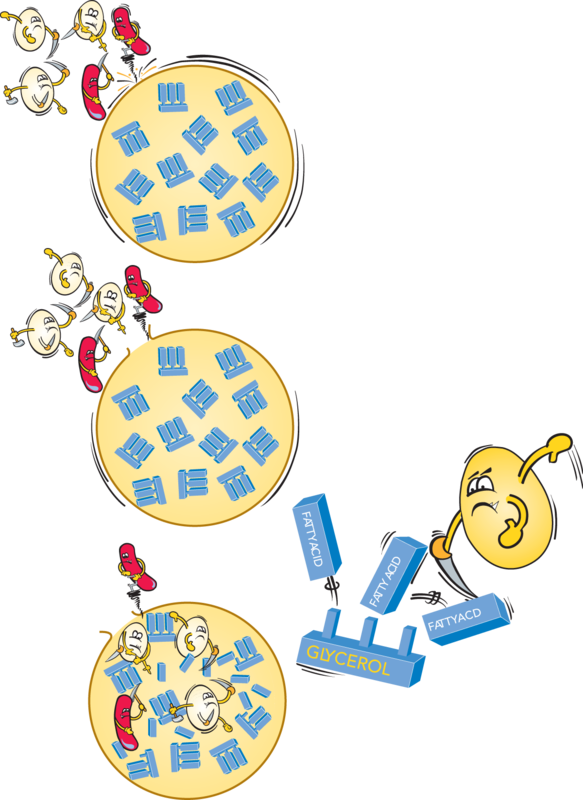 The forces holding the micelle together are hydrophobic interactions between protein groups, cross-links between peptide chains by the nanoclusters and ionic bonds. The dual-binding model (Figure 2.30) was proposed by Horne (1998) who suggests that a balance of both hydrophobic interactions between casein molecules and crosslinking with colloidal calcium phosphate holds the micelle. The sub-micelle model (Morr 1967; Slattery and Evard 1973; Walstra 1999) suggest that the casein micelle is built up of smaller micelles, sub-micelles some 10-15nm in diameter, which are linked together by calcium phosphate clusters see figure 2.31. A casein micelle structure is not fixed, but dynamic. A casein micelle and its surrounding keep exchanging components. It responds to changes in the micellar environment, temperature, pH and pressure. If the hydrophilic protruding chain end of κ - casein on the surface of micelles is split, e.g. by rennet, the micelles will lose their solubility and start to aggregate and form casein curd. In an intact micelle there is a surplus of negative charges, so they repel each other. 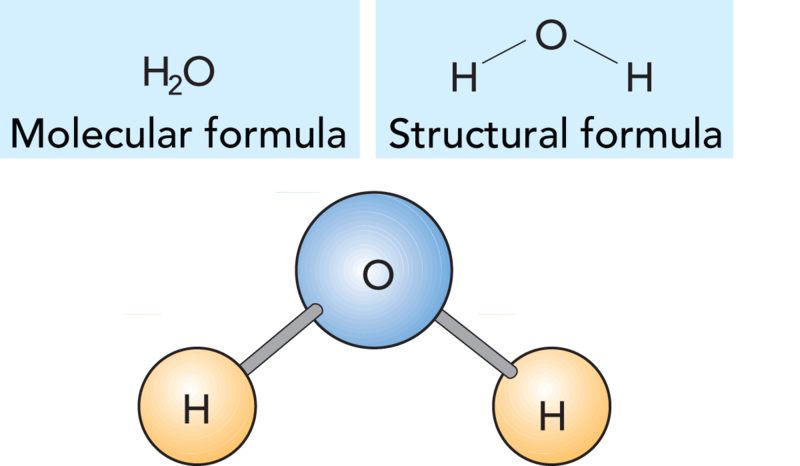 Water molecules held by the hydrophilic sites of κ - casein form an important part of this balance. If the hydrophilic sites are removed, water will start to leave the structure. This gives the attracting forces room to act. New bonds are formed, one of the salt type, where calcium is active, and the second of the hydrophobic type. These bonds will then enhance the expulsion of water and the structure will finally collapse into a dense curd. 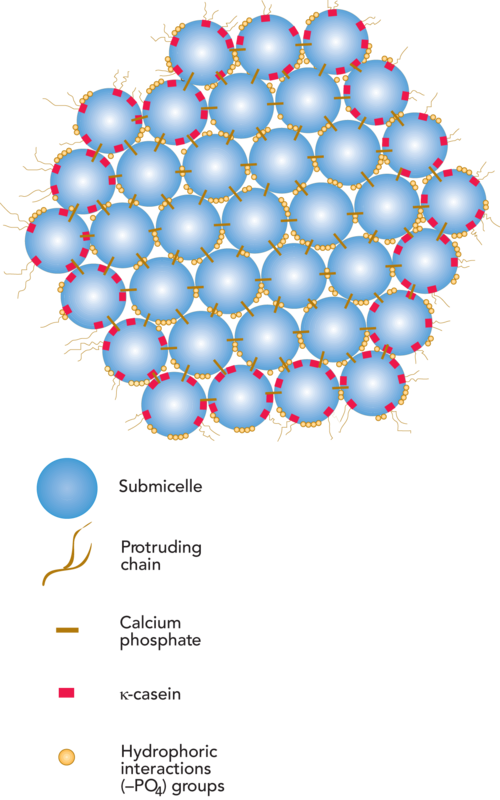 The micelles are adversely affected by low temperature, at which the β - casein chains start to dissociate and the CCP leaves the micelle structure, where it existed in colloidal form, and goes into solution. The explanation of this phenomenon is that b - casein is the most hydrophobic casein, and that the hydrophobic interactions are weakened when the temperature is lowered. Micelles appear to disintegrate and the voluminosity of the casein micelles increases. The loss of CCP causes a weaker attraction between individual casein molecules. These changes make the milk less suitable for cheese making, as they result in longer renneting time and a softer curd. β - casein is then also more easily hydrolysed by various proteases in the milk after leaving the micelle. Hydrolysis of β - casein to γ - casein and proteose-peptones means lower yield at cheese production because the proteose-peptone fractions are lost in the whey. The breakdown of β -casein may also result in formation of bitter peptides, causing off-flavour problems in the dairy products. On increasing the temperature, the micelles shrink somewhat and the amount of CCP increases. When serum proteins are present during heating , the serum proteins become associated with casein micelles during their heat denaturation and they largely become bound to the micelle surface. One example is the association of β - lactoglobulin with κ - casein during heat treatment. Most of these associations cannot be reversed by cooling. One characteristic property of casein is its ability to precipitate. Due to the complex nature of the casein molecules, and that of the micelles formed from them, precipitation can be caused by many different agents. It should be observed that there is a great difference between the optimum precipitation conditions for casein in micellar and non-micellar form, e.g. as sodium caseinate. The following description refers mainly to precipitation of micellar casein. The pH will drop if an acid is added to milk or if acid-producing bacteria are allowed to grow in milk. This will change the environment of the casein micelles in two ways. The course of events is illustrated in Figure 2.33. Firstly colloidal calcium hydroxyphosphate, present in the casein micelle, will dissolve and form ionized calcium, which will penetrate the micelle structure and create strong internal calcium bonds. Secondly the pH of the solution will approach the isoelectric points of the individual casein species. Both methods of action initiate a change within the micelles, starting with growth of the micelles through aggregation and ending with a more or less dense coagulum. Depending on the final value of the pH, this coagulum will either contain casein in a salt form, or casein in its isoelectric state, or both. The isoelectric points of the casein components depend on the ions of other kinds present in the solution. Theoretical values, valid under certain conditions, are pH 5.1 to 5.3. In salt solutions, similar to the condition of milk, the range for optimum precipitation is pH 4.5 to 4.9. A practical value for precipitation of casein from milk is pH 4.6. If a large excess of sodium hydroxide is added to the precipitated iso-electric casein, the redissolved casein will be converted into sodium caseinate, partly dissociated into ions. 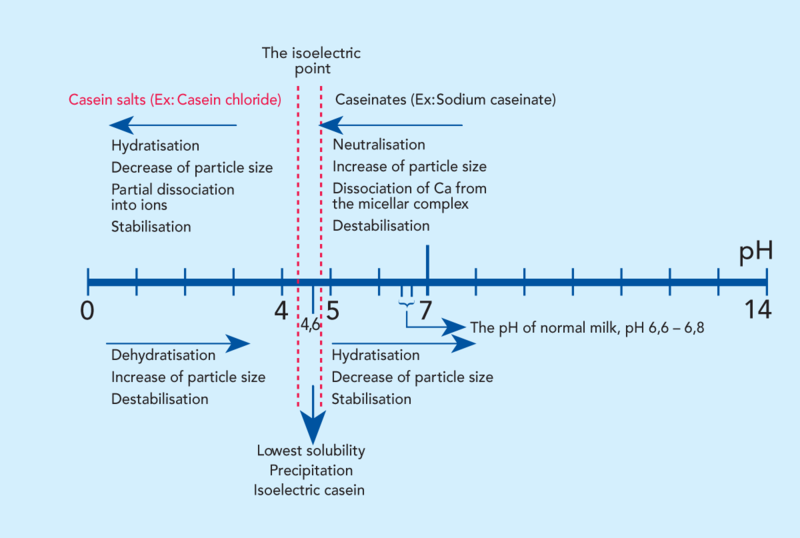 The pH of cultured milk products is usually in the range of 3.9 – 4.5, which is on the acid side of the isoelectric points. In the manufacture of casein from skim milk by the addition of sulphuric or hydrochloric acid, the pH chosen is often 4.6. Note: If a large excess of acid is added to a given coagulum, the casein will redissolve, forming a salt with the acid. If hydrochloric acid is used, the solution will contain casein hydrochloride, partly dissociated into ions. The amino acid chain forming the κ - casein molecule consists of 169 amino acids. From an enzymatic point of view the bond between amino acids 105 (phenylalanine) and 106 (methionine) is easily accessible to many proteolytic enzymes. Some proteolytic enzymes will attack this bond and split the chain. The soluble amino end contains amino acids 106 to 169, which are dominated by polar amino acids and the carbohydrate, which gives this sequence hydrophilic properties. This part of the κ - casein molecule is called the glycomacropeptide and is released into the whey in cheese making. The remaining part of the κ - casein, consisting of amino acids 1 to 105, is insoluble and remains in the curd together with αs- and β - casein. This part is called para-κ-casein. The formation of the curd is due to the sudden removal of the hydrophilic macropeptides and the consequent imbalance in intermolecular forces. 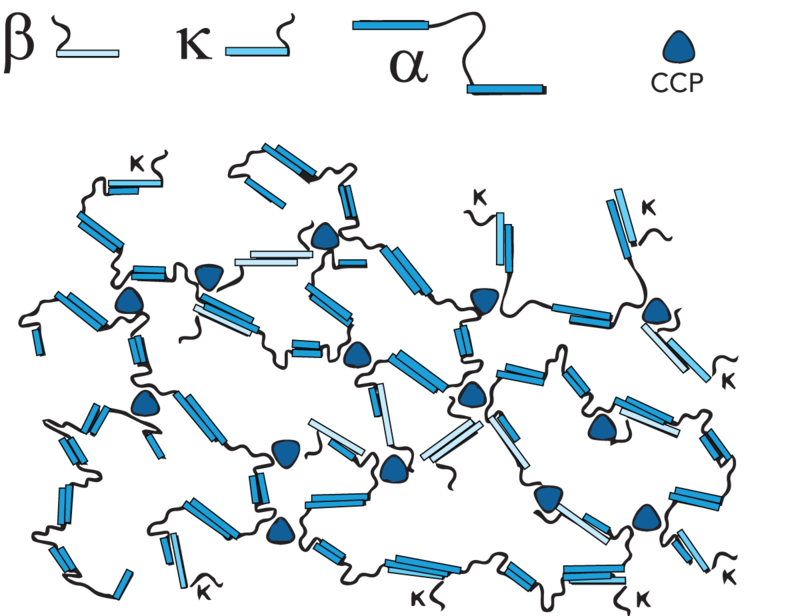 Bonds between hydrophobic sites start to develop and are enforced by calcium bonds that develop as the water molecules in the micelles start to leave the structure. This process is usually referred to as the phase of coagulation and syneresis. The splitting of the 105 – 106 bond in the κ - casein molecule is often called the primary phase of the rennet action, while the phase of coagulation and syneresis is referred to as the secondary phase. There is also a tertiary phase of rennet action, where the rennet attacks the casein components in a more general way. This occurs during cheese ripening. The durations of the three phases are determined mainly by pH and temperature. In addition the secondary phase is strongly affected by the calcium ion concentration and by the condition of micelles with regard to absence or presence of denatured milk serum proteins on the surfaces of the micelles. Three simplified stages of influence on casein by an acid and alkali respectively. Whey protein is the name commonly applied to milk serum proteins. If the casein is removed from skim milk by a precipitation method, such as the addition of mineral acid, a group of proteins remains in solution that are called milk serum proteins. As long as they are not denatured by heat, they are not precipitated at their isoelectric points. When milk is heated, some of the whey proteins denature and form complexes with casein, thereby decreasing the ability of the casein to be attacked by rennet and to bind calcium. Curd from milk heated to a high temperature will not release whey as ordinary cheese curd does, due to the smaller number of casein bridges within and between the casein molecules. Whey proteins in general, and α-lactalbumin in particular, have very high nutritional values. Their amino acid composition is very close to that which is regarded as a biological optimum. Whey protein derivatives are widely used in the food industry. This protein may be considered to be the typical whey protein. It is present in milk from all mammals and plays a significant part in the synthesis of lactose in the udder. This protein is found only in ungulates and is the major whey protein component of milk from cows. If milk is heated to over 60 °C, denaturation is initiated where the reactivity of the sulphur-amino acid of β-lactoglobulin plays a prominent part. Sulphur bridges start to form between the β-lactoglobulin molecules, between one β-lactoglobulin molecule and a κ-casein molecule and between β-lactoglobulin and α-lactalbumin. At high temperatures, sulphurous compounds such as hydrogen sulphide are gradually released. These sulphurous compounds are responsible for the “cooked” flavour of heat treated milk. 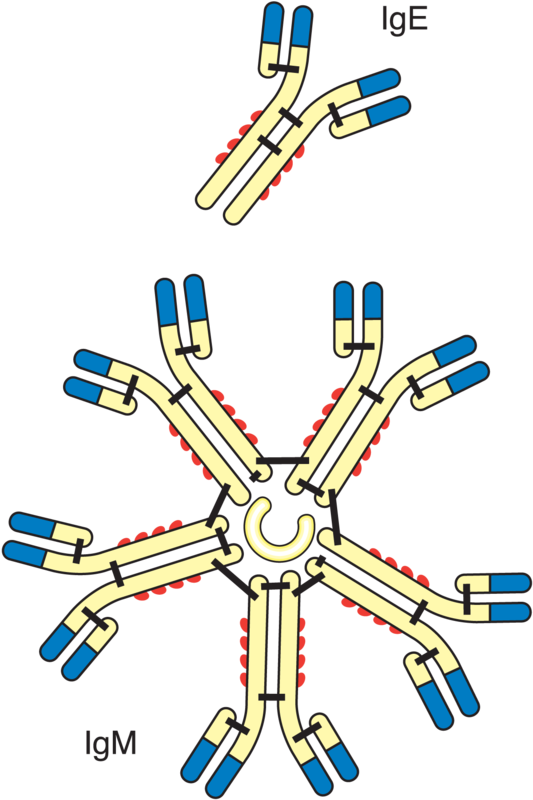 Schematic shape of two immunoglobulins.Ref. P.F. Fox and P.L.H. McSweeney, Dairy Chemistry and Biochemistry, 1998. This protein group is extremely heterogeneous, and few of its members have been studied in detail, Figure 2.34. Immunoglobulins are antibodies synthesized in response to stimulation by specific antigens. They are specifically present in blood. Their content in cows’ milk is low, but some of them are present in higher levels in colostrum and human milk. They can also act against “particles” such as bacteria, viruses and even fat globules, and flocculate them, a reaction called agglutination. In this way, bacteria can also be flocculated on fat globules and accumulate in the cream layer. When microorganisms are flocculated, their growth and action can be significantly inhibited. The agglutination reaction is specific with respect to a particular antigen. However, some of the agglutinates are non-specific, especially in the case of so called cryo precipitation – agglutination that takes place in cold milk at temperatures below 37 °C. The proteins involved are called cryoglobulins. The agglutinins are inactivated by heat treatment and their ability to flocculate particles disappears. Because of that, agglutination does not occur in pasteurized milk. In the future, many substances of importance will probably be isolated on a commercial scale from milk serum or whey. Lactoferrin and lactoperoxidase are substances of possible use in the pharmaceutical and food industries, and are now isolated from whey by a commercial process. Lactoferrin is also an inhibitor of bacteria including B. stearothermophilus and B. subtilis. The inhibition is caused by removal of iron from their serum. Membrane proteins cover the surface of the fat globule. Membrane proteins are a group of proteins that form a protective layer around fat globules to stabilize the emulsion, Figure 2.35. Their consistency ranges from soft and jelly-like, in some of the membrane proteins, to rather tough and firm in others. Some of the proteins contain lipid residues and are called lipoproteins. The lipids and the hydrophobic amino acids of those proteins make the molecules direct their hydrophobic sites towards the fat surface, while the less hydrophobic parts are oriented towards the water. Weak hydrophobic membrane proteins attack these protein layers in the same way, forming a gradient of hydrophobia from fat surface to water. The gradient of hydrophobia in such a membrane makes it an ideal place for adsorption for molecules of all degrees of hydrophobia. Phospholipids and lipolytic enzymes in particular are adsorbed within the membrane structure. No reactions occur between the enzymes and their substrate as long as the structure is intact, but as soon as the structure is destroyed the enzymes have an opportunity to find their substrate and start reactions. An example of enzymatic reaction is the lipolytic liberation of fatty acids when milk has been pumped cold with a faulty pump, or after homogenization of cold milk without immediate pasteurization afterwards. The fatty acids and some other products of this enzymatic reaction give a “rancid” flavour to the product. As long as proteins exist in an environment with a temperature and pH within their limits of tolerance, they retain their biological functions. But if they are heated to temperatures above a certain maximum their structure is altered. They are said to be denatured, Figure 2.36. The same thing happens if proteins are exposed to acids or bases, to radiation or to high pressure. The proteins are denatured and lose their original solubility. When proteins are denatured, their biological activity ceases. Enzymes, a class of proteins whose function is to catalyse reactions, lose this ability when denatured. The reason is that certain bonds in the molecule are broken, changing the structure of the protein. After a weak denaturation, proteins can sometimes revert to their original state, with restoration of their biological functions. In many cases, however, denaturation is irreversible. The proteins in a boiled egg, for example, cannot be restored to the raw state. Part of a whey protein in native (left) and denatured state. Milk contains a large number of substances which can act either as weak acids or as weak bases, e.g. lactic acid, citric acid and phosphoric acid and their respective salts: lactates, citrates and phosphates. In chemistry, such a system is called a buffer solution because, within certain limits, the pH value remains constant when acids or bases are added. This effect can be explained by the characteristic qualities of the proteins. NH3+ ions. The pH value, however, is hardly affected at all, as the increase in the concentration of free hydrogen ions is very small. When a base is added to milk, the hydrogen ions (H+) in the COOH groups of the side chains are released, forming a COO– group. Because of this, the pH value remains more or less constant, see figure 2.38. The more base that is added, the greater the number of hydrogen ions released. Other milk constituents also have this ability to bind or release ions, and the pH value therefore changes very slowly when acids or bases are added. 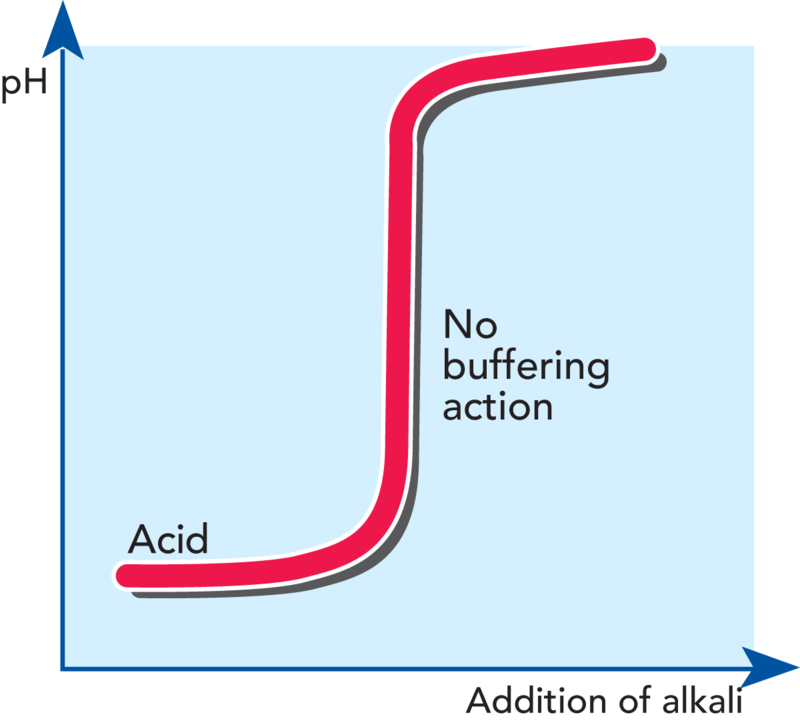 If an alkali is added to acid the pH of the solution rises immediately – there is no buffering action. 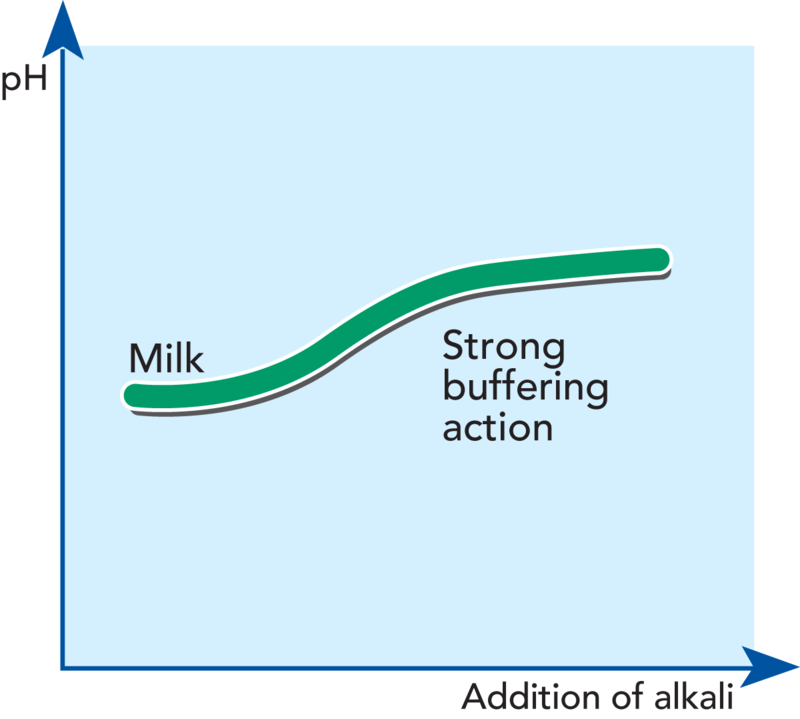 If an alkali is added to milk the pH changes very slowly – there is a considerable buffering action in milk. Enzymes are proteins having the ability to trigger chemical reactions and to affect the course and speed of such reactions. Enzymes do this without being consumed. They are therefore sometimes called biocatalysts. The functioning of an enzyme is illustrated in Figure 2.39. The action of enzymes is specific; each type of enzyme catalyses only one type of reaction. Two factors which strongly influence enzymatic action are temperature and pH. As a rule, enzymes are most active in an optimum temperature range between 25 and 50 °C. Their activity drops if the temperature is increased beyond optimum, ceasing altogether somewhere between 50 and 120 °C. At these temperatures the enzymes are more or less completely denatured (inactivated). The temperature of inactivation varies from one type of enzyme to another – a fact which has been widely utilized for the purpose of determining the degree of pasteurization of milk. Enzymes also have their optimum pH ranges; some function best in acid solutions, others in an alkaline environment. The enzymes in milk come either from the cow’s udder or from bacteria. The former are normal constituents of milk and are called original enzymes. The latter, bacterial enzymes, vary in type and abundance according to the nature and size of the bacterial population. Several of the enzymes in milk are utilized for quality testing and control. Among the more important ones are peroxidase, catalase, phosphatase and lipase. The molecule splits. The enzyme is now free to attack and split another molecule in the same way. Peroxidase transfers oxygen from hydrogen peroxide (H2O2) to other readily oxidizable substances. This enzyme is inactivated if the milk is heated to 80 °C for a few seconds, a fact which can be used to prove the presence or absence of peroxidase in milk and thereby check whether or not a pasteurization temperature above 80 °C has been reached. This test is called Storch’s peroxidase test. Catalase splits hydrogen peroxide into water and free oxygen. By determining the amount of oxygen that the enzyme can release in milk, it is possible to estimate the catalase content of the milk and learn whether or not the milk has come from an animal with a healthy udder. Milk from diseased udders has a high catalase content, while fresh milk from a healthy udder contains only an insignificant amount. There are, however, many bacteria that produce this kind of enzyme. Catalase is destroyed by heating at 75 °C for 60 seconds. Phosphatase has the property of being able to split certain phosphoric-acid esters into phosphoric acid and the corresponding alcohols. The presence of phosphatase in milk can be detected by adding a phosphoric-acid ester and a reagent that changes colour when it reacts with the liberated alcohol. A change in colour reveals that the milk contains phosphatase. Phosphatase is destroyed by ordinary pasteurization (72 °C for 15 – 20 seconds), so the phosphatase test can be used to determine whether the pasteurization temperature has actually been attained. The routine test used in dairies is called the phosphatase test according to Scharer. The phosphatase test should preferably be performed immediately after heat treatment. In other cases, the milk must be chilled to below + 5 °C and kept at that temperature until analysed. The analysis should be carried out the same day, otherwise a phenomenon known as reactivation may occur, i.e. an inactivated enzyme becomes active again and gives a positive test reading. Cream is particularly susceptible in this respect. 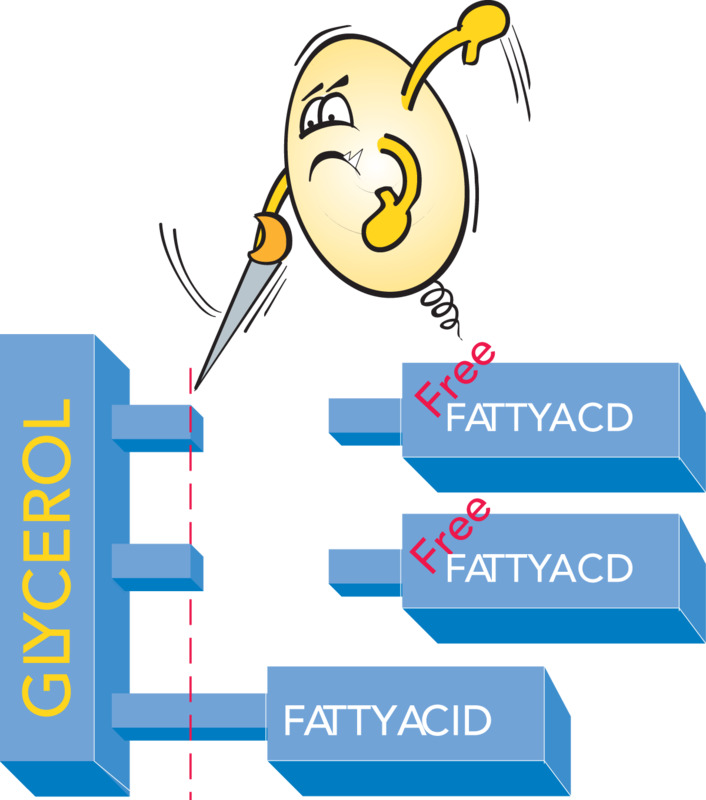 Lipase splits fat into glycerol and free fatty acids, see figure 2.40. Excess free fatty acids in milk and milk products result in a rancid taste. The action of this enzyme seems, in most cases, to be very weak, though the milk from certain cows may show strong lipase activity. The quantity of lipase in milk is believed to increase towards the end of the lactation cycle. Lipase is, to a great extent, inactivated by pasteurization, but higher temperatures are required for total inactivation. Many microorganisms produce lipase. This can cause serious problems, as the enzyme is very resistant to heat. Lactose is a sugar found only in milk; it belongs to the group of organic chemical compounds called carbohydrates. Carbohydrates are the most important energy source in our diet. Bread and potatoes, for example, are rich in carbohydrates, and provide a reservoir of nourishment. They break down into high-energy compounds that can take part in all biochemical reactions, where they provide the necessary energy. Carbohydrates also supply material for the synthesis of some important chemical compounds in the body. They are present in muscles as muscle glycogen and in the liver as liver glycogen. Glycogen is an example of a carbohydrate with a very large molecular weight. Other examples are starch and cellulose. Such composite carbohydrates are called polysaccharides and have giant molecules made up of many glucose molecules. 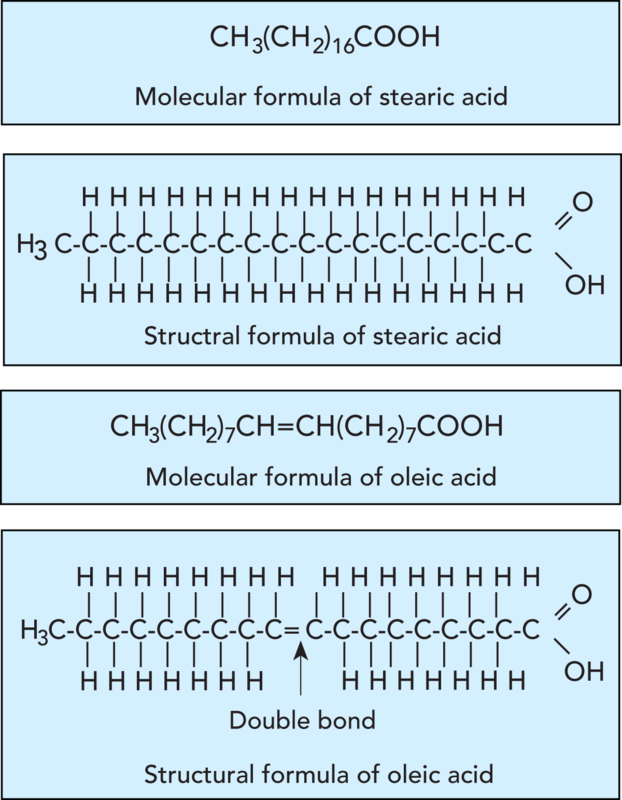 In glycogen and starch the molecules are often branched, while in cellulose they are in the form of long, straight chains. Figure 2.41 shows some disaccharides, i.e. carbohydrates composed of two types of sugar molecules. The molecules of sucrose (ordinary cane or beet sugar) consist of two simple sugars (monosaccharides), fructose and glucose. Lactose (milk sugar) is a disaccharide, with a molecule containing the monosaccharides glucose and galactose. Table 2.3 shows that the lactose content of milk varies between 3.6 and 5.5%. Figure 2.42 shows what happens when lactose is decomposed by lactic acid bacteria. Lactose is transported into the bacterial cell where enzymes attack the lactose, splitting it into glucose and galactose. 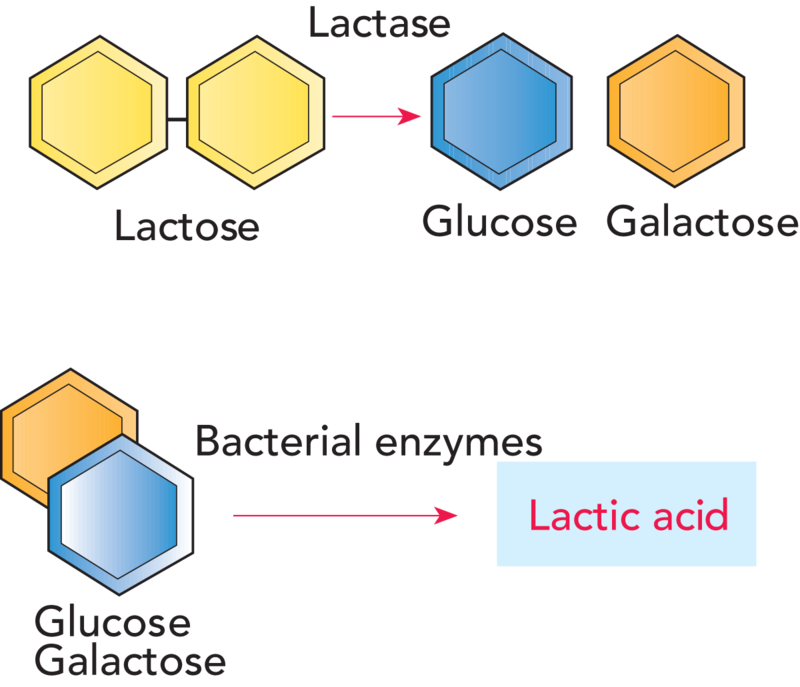 Other enzymes from the lactic-acid bacteria then attack the glucose and galactose, which are converted via complicated intermediary reactions into mainly lactic acid. The enzymes involved in these reactions act in a certain order. This is what happens when milk goes sour; lactose is fermented to lactic acid. Other microorganisms in the milk generate other breakdown pro-ducts. If milk is heated to a high temperature, and is kept at that temperature, it turns brown and acquires a caramel taste. 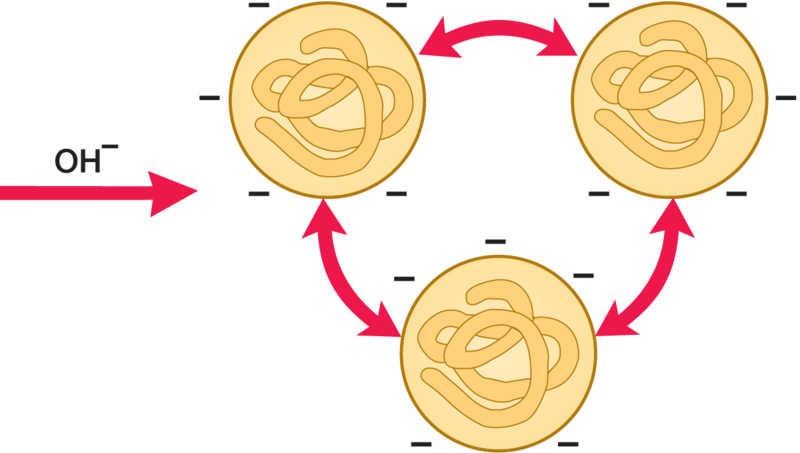 This process is called caramelization and is the result of a chemical reaction between lactose and proteins called the Maillard reaction. Maillard reactions are initiated by heat treatment and continue during storage of the product. 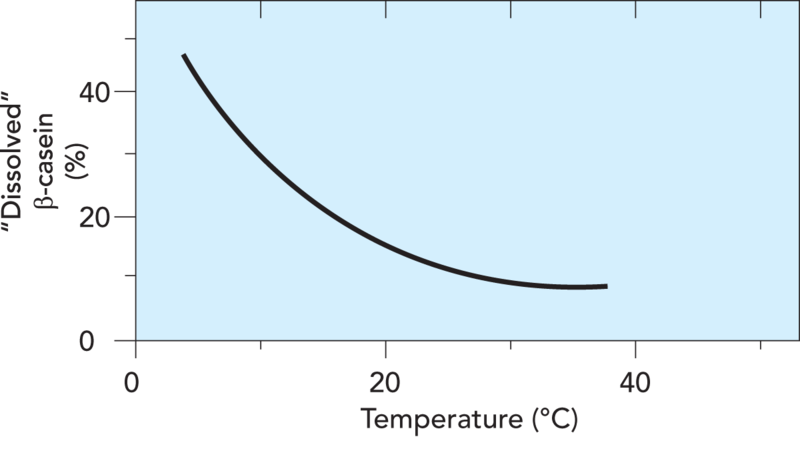 The reaction kinetics is directly dependent on factors such as heat load and storage temperature. Lactose is water soluble, occurring as a molecular solution in milk. In cheese making, most of the lactose remains dissolved in the whey. Evaporation of whey in the manufacture of whey cheese increases the lactose concentration further. Lactose is not as sweet as other sugars; it is about 30 times less sweet than cane sugar, for example. 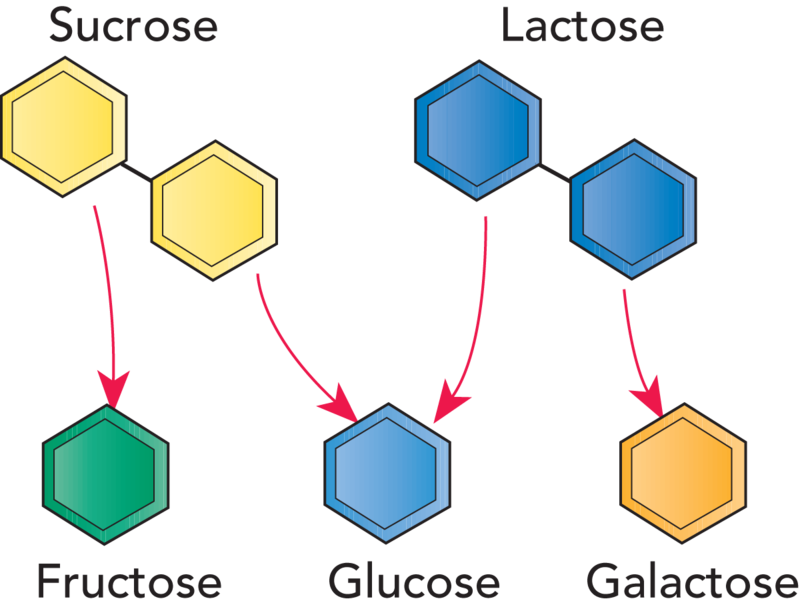 Lactose and sucrose are split to galactose, glucose and fructose. Breakdown of lactose by enzymatic action and formation of lactic acid. Vitamins are organic substances that occur in very small concentrations in both plants and animals. They are essential to normal life processes, but cannot be synthesized by the body. The chemical composition of vitamins is usually very complex, but that of most vitamins is now known. Vitamins are designated by capital letters, sometimes followed by numerical subscripts, e.g. A, B1 and B2. Milk is a good source of vitamins, which are present in varying amounts. Among the best known are A, the vitamin B group, vitamin C and D. Vitamins A and D are soluble in fat, or fat solvents, while the others are soluble in water. In terms of fat-soluble vitamins, A and D are the most important. They affect eyesight and skin. For natural reasons, low-fat milk products contain less of these vitamins. In many countries this deficiency in low-fat milk is compensated for by enrichment with vitamins A and D, in order to achieve the same vitamin level as whole milk. Table 2.6 lists the amounts of vitamins in one litre of market milk and the daily vitamin requirements of an adult person. The table shows that milk is a good source of vitamins. Lack of vitamins can result in deficiency diseases, see Table 2.7. Milk always contains somatic cells (white blood corpuscles or leucocytes). The content is low in milk from a healthy udder, but increases if the udder is diseased, usually in proportion to the severity of the disease. The somatic cell content of milk from healthy animals is as a rule lower than 200 000 cells/ml, but counts of up to 400 000 cells/ml can be accepted. Milk also contains gases, some 5 – 6% by volume in milk fresh from the udder, but on arrival at the dairy, the gas content may be as high as 10% by volume. The gases consist mostly of carbon dioxide, nitrogen and oxygen. Dispersed and dissolved gases are a serious problem in the processing of milk, which is liable to burn on to heating surfaces if it contains too much gas. The fat and protein in milk may undergo chemical changes during storage. These changes are normally of two kinds: oxidation and lipolysis. 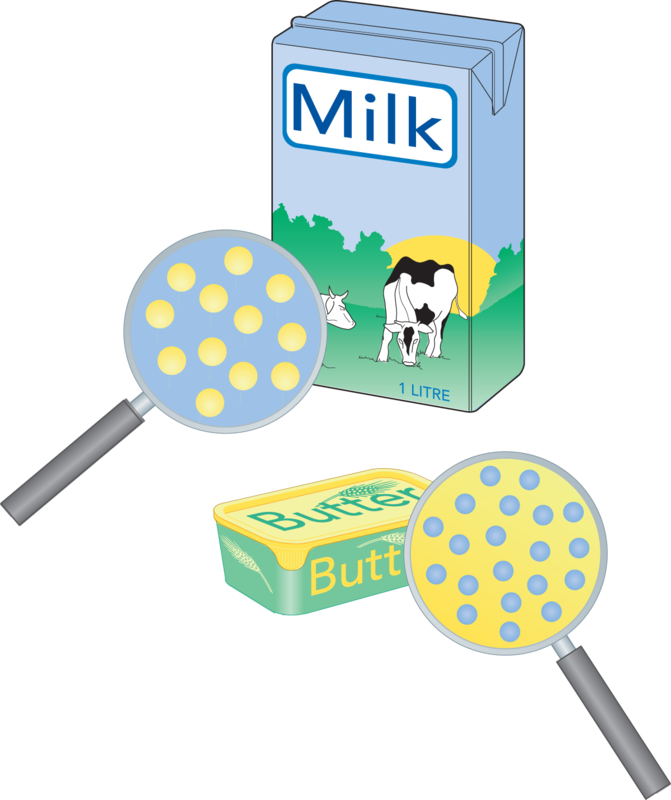 The resulting reaction products can cause off-flavours, principally in milk and butter. Oxidation of fat results in a metallic flavour, while it gives butter an oily, tallowy taste. Oxidation occurs at the double bonds of the unsaturated fatty acids, those of lecithin being the most susceptible to attack. The presence of iron and copper salts accelerates the onset of auto-oxidation and development of metallic flavour, as does the presence of dissolved oxygen and exposure to light, especially direct sunlight or light from fluorescent tubes. Oxidation of fat can be partly counteracted by microorganisms in the milk, by pasteurization at a temperature above 80 °C, or by antioxidant additives (reducing agents). Microorganisms such as lactic-acid bacteria consume oxygen and have a reducing effect. Oxidation off-flavour is more liable to occur at low temperatures, because these bacteria are less active then. The solubility of oxygen in milk is also higher at low temperatures. High-temperature pasteurization helps, as reducing compounds, –SH groups, are formed when milk is heated. The metallic oxidation off-flavour is more common in winter than in summer. This is partly due to the lower ambient temperature and partly to differences in the cows’ diet. Summer feed is richer in vitamins A and C, which increase the amount of reducing substances in the milk. In the presence of light and/or heavy metal ions, the fatty acids are further broken down in steps into aldehydes and ketones, which give rise to off-flavours such as oxidation rancidity in fat dairy products. When exposed to light, the amino acid methionine is degraded to methional by a complicated participation of riboflavin (Vitamin B2) and ascorbic acid (Vitamin C). Methional or 3-mercapto-methylpropionaldehyde is the principal contributor to sunlight flavour, as this particular flavour is called. Since methionine does not exist as such in milk, but as one of the components of the milk proteins, fragmentation of the proteins must occur incidental to development of the off-flavour. Intensity of light (sunlight and/or artificial light, especially from fluorescent tubes). Certain properties of the milk – homogenized milk has turned out to be more sensitive than non-homogenized milk. Nature of package – opaque packages such as plastic and paper give good protection under normal conditions. See also Chapter 8 concerning maintenance of the quality of pasteurized milk. When fat globule membranes are damaged, lipolysis can release fatty acids. The breakdown of fat into glycerol and free fatty acids is called lipolysis. Lipolysed fat has a rancid taste and smell, caused by the presence of low-molecular free fatty acids (butyric and caproic acid). Milk is heat treated at the dairy to kill any pathogenic microorganisms that may be present. Heat treatment also causes changes in the constituents of the milk. The higher the temperature and the longer the exposure to heat, the greater the changes. Within certain limits, time and temperature can be balanced against each other. Brief heating to a high temperature can have the same effect as longer exposure to a lower temperature. 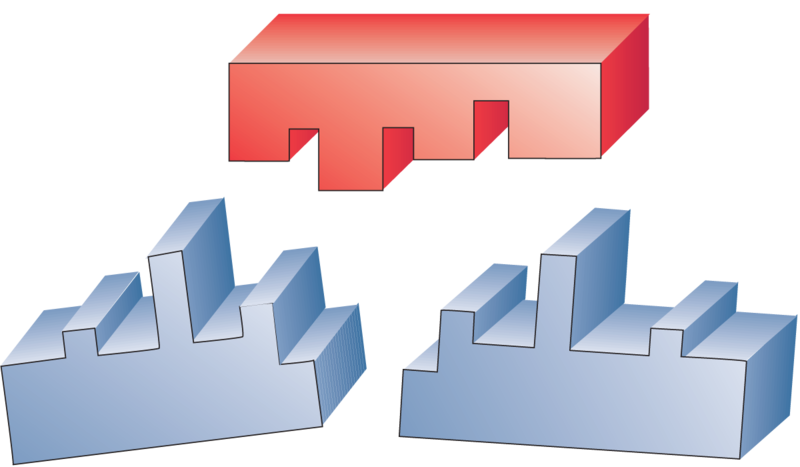 Both time and temperature must therefore always be considered in connection with heat treatment. Of the main components, fat is probably the least affected by heat. However, heat induced changes do occur in the milk fat especially related to the physical properties. The principal effect of heat treatments on milk fat is on creaming of the fat globules. A cream plug formation has been shown to occur when milk is pasteurized at 70 – 80 °C for 15 seconds (Thomé et al, Milchwissenschaft 13, 115, 1958), see Figure 2.44. Various theories have been discussed, but it appears that liberated free fat cements the fat globules when they collide. Homogenization is recommended to avoid cream plug formation. A. Fink and H.G. Kessler (Milchwissenschaft 40. 6-7, 1985) have shown that free fat leaks out of the globules in cream with 30% fat, unhomogen-ized as well as homogenized, when it is heated to temperatures between 105 and 135 °C. This is believed to be caused by destabilization of the globule membranes resulting in increased permeability, as a result of which the extractable free fat acts as a cement between colliding fat globules and produces stable clusters. Above 135 °C, the proteins deposited on the fat globule membrane form a network that makes the membrane denser and less permeable. Homogenization downstream of the sterilizer is therefore recommended in UHT treatment of products with a high fat content. 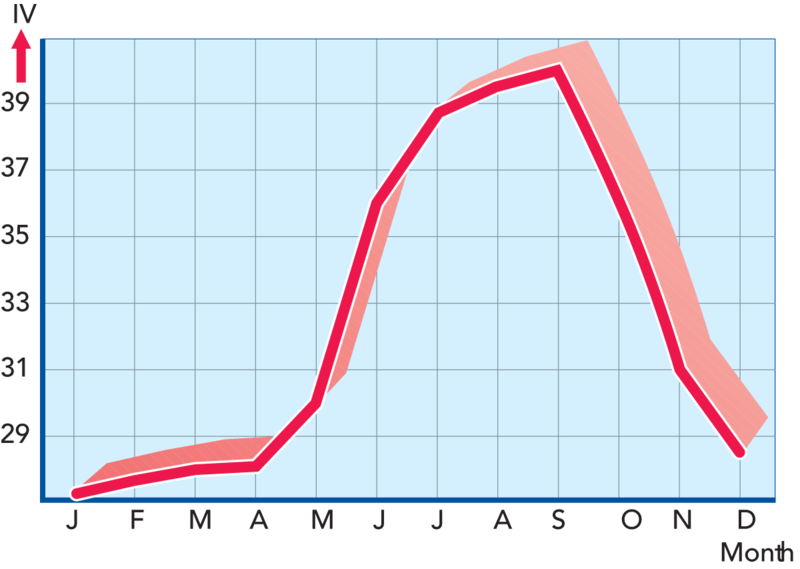 Cream plug formation in milk as a function of pasteurization temperature. Scale from 0 (no effect) to 4 (solid cream plug). All pasteurization was short-time (about 15 s).Ref: Thomé et al. During denaturation κ-casein adheres to β-lactoglobulin. The major protein, casein, is not considered denaturable by heat within normal ranges of pH, salt and protein content. Whey proteins, on the other hand, particularly β - lactoglobulin which makes up about 50 % of the whey proteins, are fairly heat sensitive. Denaturation begins at 65°C and is almost total when whey proteins are heated to 90 °C for five minutes. Whey protein heat denaturation is an irreversible reaction. 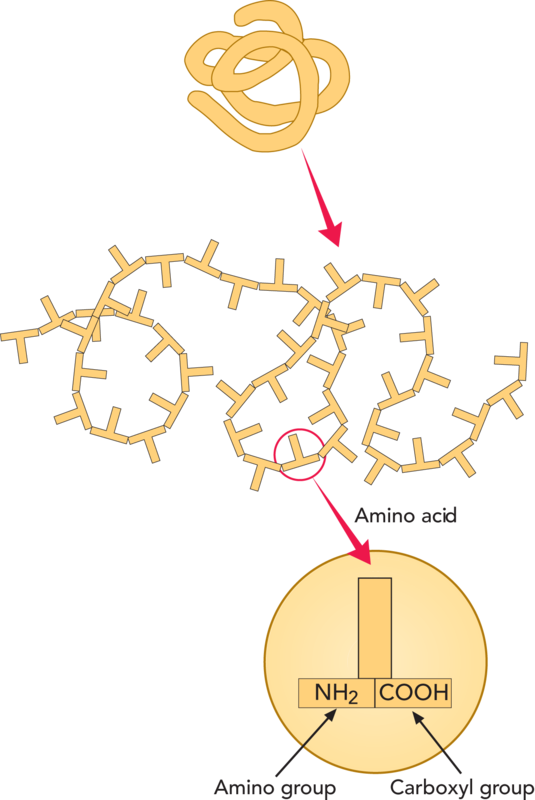 The randomly coiled proteins "open up", and β - lactoglobulin in particular is among others bound to the protruding κ - casein chain by sulphur bridges. The strongly generalized transformation is shown in Figure 2.45. Blockage of a large proportion of the κ - casein interferes with the renneting ability of the milk, because the rennet used in cheese making is hindered in its action to split the κ - casein from the casein micelles. The higher the pasteurization temperature at constant holding time, the softer the coagulum. This is an undesirable phenomenon in production of semi-hard and hard types of cheese. However, due to the possibility that pathogenic bacterias may survive and multiply in cheese made from raw milk (in particular Listeria monocytogenes) it is recommended to pasteurise milk intended for cheese production at 72°C for 15-20 seconds for food safety reasons. Cheese can also be made from raw milk but is then strictly controlled from national legislation. In milk intended for cultured milk products (yoghurt, etc. ), the whey protein denaturation and interaction with casein obtained at 90 – 95 °C for 3 – 5 minutes will contribute to improved quality by reduced syneresis and improved viscosity. Milk heated at 75 °C for 20 – 60 seconds will start to smell and taste “cooked”. This is due to release of sulphurous compounds from β - lactoglobulin and other sulphur-containing proteins, inactive lipoproteins. Enzymes can be inactivated by heating. The temperature of inactivation varies according to the type of enzyme. There are some bacteria, Pseudomonas spp, (spp = species), which are very often cited among the spoilage flora of both raw cold-stored milk and heat-treated milk products; they have extremely heat-resistant proteolytic and lipolytic enzymes. Only a fraction of their activity is inhibited by pasteurization or UHT treatment of the milk. Lactose undergoes changes more readily in milk than in the dry state. At temperatures above 100 °C, a reaction takes place between lactose and protein, resulting in a brownish colour. The series of reactions, occurring between amino groups of amino acid residues and aldehyde groups from milk carbohydrates, is called the Maillard reaction or browning reaction. It results in a browning of the product and a change of flavour as well as loss in nutritional value, particularly loss of lysine, one of the essential amino acids. between pasteurized, UHT and sterilized milks (Martinez Castro & Olano, 1982, and Geier & Klostermeyer, 1983). Milk is an important source of A, D and group B vitamins. The fat-soluble vitamins are very thermostable and their level is not lowered by heat treatment. However, when milk is fortified with vitamin A, the relative loss seems to increase. Losses of vitamins mainly concern vitamin C and some of the group B vitamins. The loss of vitamin C as such is generally of minor importance, as milk is not an important source of this vitamin, but it may influence the nutritional value anyway. The breakdown of vitamin C is connected with that of vitamin B12 and protects folic acid from oxidation. The degradation of vitamins is not only related to the heat treatment, but also to storage of the final product. The loss of vitamins during storage can largely be avoided if oxygen and light penetration are excluded. Vitamin C and B9 may completely disappear within a few days if a high level of oxygen is present. The reaction is catalysed by riboflavin (vitamin B2) and accelerated by exposure to light. Most of the riboflavin disappears after long-term exposure to light. Losses of some vitamins due to different treatments are presented in Table 2.8. The solubility of calcium phosphate is very temperature-dependent. Unlike most compounds, the solubility of calcium phosphate decreases with temperature. This means that heating causes precipitation of calcium phosphate in the form of CCP in the micelle, while cooling increases the concentration of soluble calcium phosphate. After cooling, the reaction is readily reversible, but after heating to high temperatures, the reversibility is more sluggish and incomplete. The changes at high temperature imply that the milk becomes more acid and the pH drops as described in Table 2.9 below. The opacity of milk is due to suspended particles of fat, proteins and certain minerals. The colour varies from white to yellow, according to the colouration (carotene content) of the fat. Skim milk is more transparent, with a slightly bluish tinge. Osmotic pressure is determined by the number of molecules or particles, not the weight of the solute; thus 100 molecules of size 10 will have 10 times the osmotic pressure of 10 molecules of size 100. It follows that for a given weight, the smaller the molecules the higher the osmotic pressure. Milk is formed from blood, the two being separated by a permeable membrane, hence they have the same osmotic pressure; in other words, milk is isotonic with blood. The osmotic pressure of blood is remarkably constant although the composition, as far as pigment, protein, etc. are concerned, may vary. The same condition applies to milk, with the total osmotic pressure as shown in Table 2.10. Ref: A Dictionary of Daiyring, J.G. Davis. The freezing point of milk is the only reliable parameter to check for adulteration with water. The freezing point of milk from individual cows has been found to vary from –0.51 to –0.55 °C. It should also be mentioned that when milk is exposed to high temperature treatment (UHT treatment or sterilization), precipitation of some phosphates will cause the freezing point to rise. The internal or osmotic pressure also defines the difference in freezing point between the solution and the solvent (water) so that the freezing point depression (D in Table 2.10) is a measure of this osmotic pressure. When the composition of milk alters due to physiological or pathological causes (e.g. late lactation or mastitis), it is called abnormal milk, but the osmotic pressure and hence the freezing point remain constant. The most important change is a fall in lactose content and a rise in chloride content. of [H+] per litre of the solution is 1:10 000 000 mol/l or 10–7 mol/l. pH represents the hydrogen ion concentration of a solution and can mathematically be defined as the negative logarithm of the hydrogen ion [H+] concentration. The pH value of a solution or product represents the present (true) acidity. Normal milk is a slightly acid solution with a pH falling between 6.6 – 6.8 with 6.7 the most usual value, at a measurement about 25 °C. The pH is checked with a pH-meter. Determination of acidity in Thörner degrees, °Th. Acidity can also be expressed as the titratable acidity. The titratable acidity of milk is the amount of a hydroxyl ion (OH–) solution of a given strength needed to increase the pH of a given amount of milk to a pH of about 8.4, the pH at which the most commonly used indicator, phenolphtalein, changes colour from colourless to pink. What this test really does is to find out how much alkali is needed to change the pH from 6.7 to 8.4. If milk sours on account of bacterial activity, an increased quantity of alkali is required, and the acidity or titration value of the milk increases. The titratable acidity can be expressed in a variety of units basically as a result of the strength of the sodium hydroxide (NaOH) needed at titration. °SH = Soxhlet Henkel degrees, obtained by titrating 100 ml of milk with N/4 NaOH, using phenolphthalein as the indicator. Normal milks give values about 7. This method is mostly used in Central Europe. °Th = Thörner degrees, obtained by titrating 100 ml of milk, diluted with 200 ml distilled water, with N/10 NaOH, using phenolphthalein as the indicator. Normal milks give values about 17. Mostly used in Sweden. °D = Dornic degrees, obtained by titrating 100 ml of milk with N/9 NaOH, using phenolphthalein as the indicator. Normal milks give values about 15. Mostly used in the Netherlands and France. % l.a. = per cent lactic acid, obtained as °D with the result divided by 100. Frequently used in the UK, USA, Canada, Australia and New Zealand. 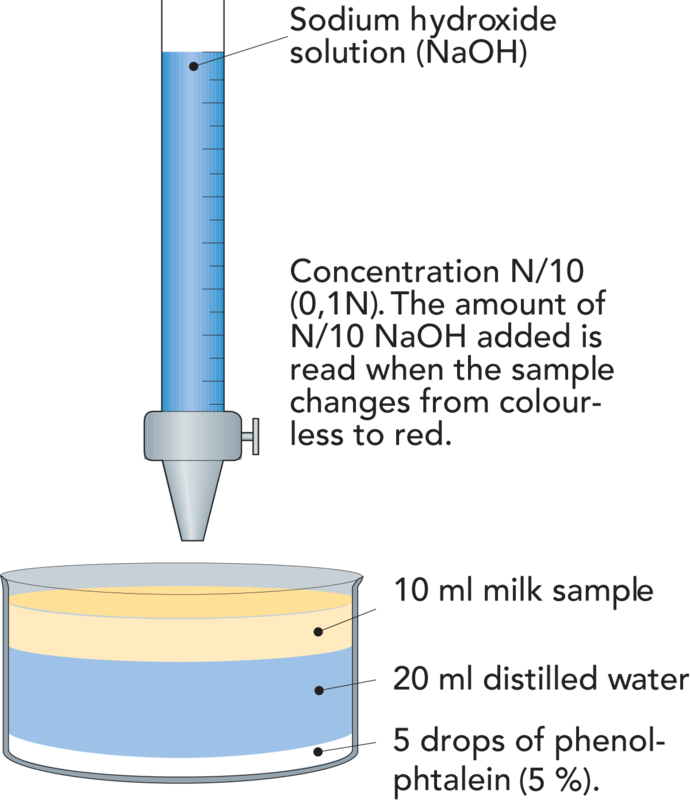 1.7 ml of N/10 NaOH are required for titration of a 10 ml sample of milk. 10 x 1.7 = 17 ml would therefore be needed for 100 ml, and the acidity of the milk is consequently 17 °Th. Changes in the composition of cows’ milk after parturition. The first milk that a cow produces after calving is called colostrum. It differs greatly from normal milk in composition and properties. One highly distinctive characteristic is the high content of whey proteins – about 11 % compared to about 0.65 % in normal milk, as shown in Figure 2.47. This results in colostrum coagulating when heated. A fairly large proportion of whey protein is immunoglobulins (Ig G, dominating in colostrum), which protect the calf from infection until its own immune system has been established. Colostrum has a brownish-yellow colour, a peculiar smell and a rather salty taste. The content of catalase and peroxidase is high. Four to five days after calving, the cow begins to produce milk of normal composition, which can be mixed with other milk. Please enter your details to continue reading the rest of the book of 480 pages essential dairy processing knowledge. Please note that entering your e-mail address here does not mean that you subscribe to any newsletters.